The Math Club held its Halloween party on Monday, October 27. Students and their faculty mentor, Dr. Amanda Harsy, dressed up in costume and ate candy and popcorn as they watched the classic horror thriller The Shining. They also had a competition for best individual and group costumes. 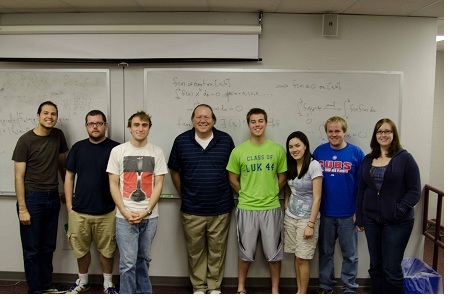 The Math Club has been very active under Dr. Harsy, who is a first-year faculty member in the Department. For example, last month, the group learned about the mathematics of poker and other games of chance. Attendance at math club meetings has been outstanding this year, with twenty to thirty students attending each meeting. The group celebrates the richness and fun of mathematics, the field that helps all the other sciences express their ideas. The Department of Mathematics and Computer Science welcomed its new majors to campus on Friday, August 22, at Lewis University's Major Mixer Event. Greeting the new Math, Computer Science, and Computer Engineering students were representatives from the Department's faculty as well as distiguished alumni from Argonne National Laboratory. Jay Johnson, Matt Kwiatkowski, and Mike Skwarek, all of whom hold executive positions in cyber security at Argonne, explained to the students the importance of what they would be studying, how our country depends on the kinds of skills and knowledge they are going to acquire, and how they have to seek out opportunities to learn as much as they can and to apply it while they are in school. The Department welcomed 62 new majors this year, which is a record. That included 44 new Computer Science Students, 11 new Math majors, and 7 students in our new Computer Engineering program. 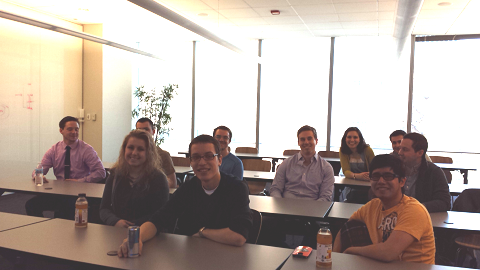 The Department is very happy that these students have chosen to study some of today's most important fields at Lewis. 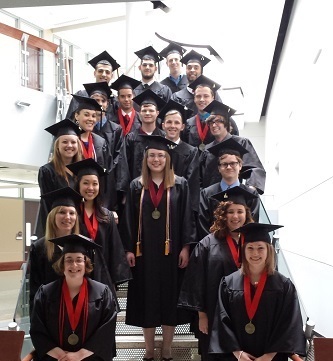 The Department of Mathematics and Computer Science is very proud of its May 2014 graduates. It was the largest graduating class in the history of the department, with 26 Computer Science majors and 10 math majors receiving their degrees. Obviously, there's a lot more to graduation than the number of students who graduated. Each of these students has grown a lot during their time at Lewis, both as people and as mathematicians and computer scientists. They have learned concepts and skills that will help them transition well to the "real world" so that they can successfully start the next chapter of their lives. Along the way, they made a lot of friends and participate in a lot of fun activities both in the department and in the broader university. Each of these students was able to live a college experience that was timely, personal, and empowering. The faculty of the department will miss these graduates, and we are quite honored to have had an opportunity to play a role in shaping their future successes. Graduating Master of Science in Information Security (MSIS) students pursuing a Technical Concentration in the program at Lewis University completed their capstone projects this May, performing innovative project and research work in diverse aspects of cyber security. You can access the reports from these projects here. The students developed these projects over a 16-week period. They started with a three-page project proposal which identified their project or research aims and outlined their planned methodology. Included in this initial proposal was an initial review of literature that cited at least five scholarly sources. Every two weeks, they submitted a five-paragraph project update and expanded bibliography. In these updates, they described three milestones they achieved for the project during the two weeks, plotted a roadmap for the upcoming two weeks, and deepened their literature review using the additional scholarly resources. At the beginning of April, the students submitted their first draft of the project report. After receiving the instructor's feedback as well as feedback from each other, the students spent April refining their report into a final version, which they submitted at the beginning of May. They then presented their work online to MSIS instructors and students. For most of these students, it was their first attempt at writing a scholarly research work, and they managed to do an impressive job. This is the most important experience in the MSIS program for the students, because it gives them an opportunity to apply what they have learned in their coursework in an integrated way to real-world problems and cutting-edge issues. This semester's students presented some of the program's finest work yet. The final Girls Create with Technology session of the year was held Saturday, May 10, 2014. Dr. Cindy Howard led a session in which she taught the attendees how to write software applications that draw and make music on the Raspberry Pi computer platform. The tools Dr. Howard showed were Sonic Pi and the Turtle Graphics package for the Python programming language. It was another great opportunity for the attendees to learn how to develop fun and interactive software, and it was yet another chance to play around with the remarkably powerful and even more remarkably inexpensive Raspberry Pi. It was an excellent way to conclude the Girls Create Technology series, which was sponsored by AT&T's Aspire program and aimed to introduce high school girls to the wonderful opportunities available to them in Computer Science. Nationwide, only 12% of students who major in Computer Science are female. There is no good reason for this gender imbalance, and universities everywhere have been scrambling to figure out the reason and how to address it. Through AT&T's generosity, we in Computer Science at Lewis were able to work with over twenty young women over the past year. With Dr. Howard's leadership and vision, we taught the girls about robotics, programming, web design, and networking. They learned how to use computers to control physical devices wirelessly and over a wired connection. The learned a number of important skills. Just as importantly, they learned that Computer Science is not "man's work". Rather, Computer Science is a creative, immersive, rewarding area of study that spurs innovation that appeals to and serves everyone. Girls Create with Technology was a unique program, and we are proud to have created and offered it here at Lewis. We wish the girls good luck in their studies, and we hope to see them in our Computer Science classes at Lewis soon. Interactive signage has a number of advantages. They can provide visitors to a public space a great deal of information very conveniently. They also bring a lot of "wow factor" to a hallway. Unfortunately, they also tend to be very expensive and require significant infrastructure to support. Geoff Powell, a senior Computer Science student from Upland, California, came up with an innovative solution. Working with Dr. Cindy Howard as part of an independent study, Geoff designed and developed an interactive display board using the Microsoft XBox Kinect, C#, and Microsoft's XNA framework. 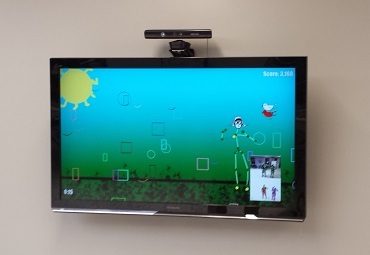 The Kinect, which is mounted above the TV, detects when a person is standing in front of the display and then provides the visitor a number of options. The visitor can browse top stories from the department website, moving from story to story by swinging her arm left or right. 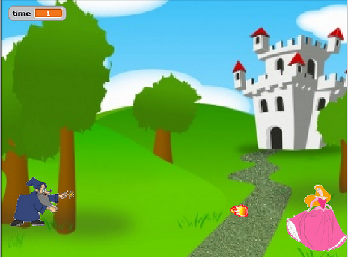 Alternatively, the visitor can choose from a couple of games, including one in which she can play the piano, and another in which she can swat at shapes that fall from the ground to gain points. There is even an interactive campus map. When the user points to a location on the map with her left or right hand, the display indicates the name of the location. Geoff designed the code to be highly modular, which means adding more features in the future will be relatively straightforward. In terms of cost, this setup required a modestly equipped PC that could run a Microsoft .net application, an XBox 360 Kinect, and a TV with VGA or HDMI inputs. The setup also requires a WiFi signal so that the website's top stories can be scraped from the site in real time rather than require manual updating. It is a low-cost, highly effective solution that has made our hallway a lot more interesting. It has given us another way to express the "wow factor" our Computer Science program strives to achieve. We thank Geoff for bringing his considerable talents to Lewis' Department of Mathematics and Computer Science. He will be graduating on May 18 and will then continue at Lewis in our Master of Science in Information Security program. He'll be adding graduate-level computer security expertise to his impressive software development skills, an unbeatable combination in this era of ever-evolving security threats. Anticipating and thwarting cyber security attacks requires a thorough understanding of how such vulnerabilities emerge through the computer code people write or mis-write. Our Computer Science majors have that understanding, and Geoff is a stellar example. 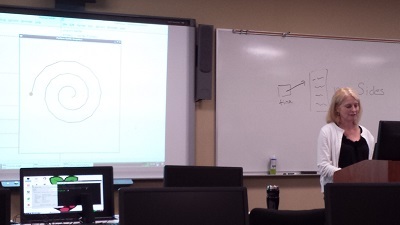 The Department of Mathematics and Computer Science held its first robotics course during the Spring 2014 semester. The course, which was taught by Dr. Dana Dominiak, focused on the design, construction, programming, and testing of a robotic arm. Eight students took the course and contributed in a variety of ways to the finished product. 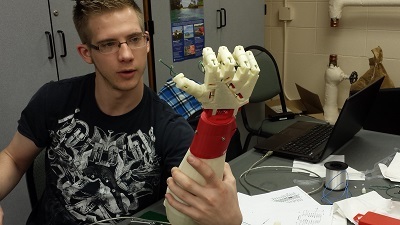 The various pieces of the hand-arm assembly were printed on a Makerbot 3D printer the Department purchased using funds donated by various alumni. The students printed the pieces and then connected them together using servos, q-tips, and 200-pound fishing line. The resulting assembly is powered by six servos which are controlled by Arduino microcontrollers programmed in C. The servos are used to control the movements of the individual digits and the rotation of the wrist. Here is a very brief video showing the hand in action. You can see the servos controlling the movement of the wrist and digits. One of the best things about this course was how it enabled students with a variety of skills to contribute to the finished product. Some students were very good at building things. Others were great programmers. Others were good designers or could help organize the project work well. It was a true team effort, one that resulted in a remarkable piece of hardware at the end. All this was accomplished in just 15 weeks. There will be more robotics courses in the future. After all, this hand and arm need a body to go along with them. Otherwise, they're just creepy. Stay tuned. 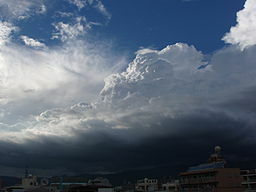 There is a model for cloud computing called softare as a service, or SAAS. Such software exists and runs "in the cloud" and provides functionality to its users upon request. The students in Dr. Howard's Software Engineering course (CS 440) take a slightly different approach to software as a service: they create software that directly helps people and organizations perform their vitally important work. This year, three software projects were developed by the students in CS 440. An application for Heart Haven Outreach to help staff there assess their strengths. A tool for Lewis' College of Nursing and Health Professions to track student progress through their program of study. A quiz system that will be used as part of a research project being conducted by Dr. Bill Chura in Biology. The project for Heart Haven Outreach, or H2O, is particularly interesting, because it demonstrates how effective university-community partnerships can be. The students who developed that project were Andrew Hiter, Eric Raber, Chris Pelech, Dennis Stachura, Tom Tibble, and Ian Ziarko. Working closely with a representive from H2O, the students developed a tool that would enable H2O administrators to survey their employees to identify their strengths and weaknesses and then plot them on a graph. The students developed from scratch an innovative and intuitive pie-style graph that clearly identified areas of strength and aspects that require improvement. H2O, the customer, was extremely impressed. Just as important, it was a fantastic learning experience for the students. Chris Pelech remarked, "As a team, not only did we use skills we learned in our core classes, such as object-oriented programming, but we also used skills earned in elective classes such as Computer Graphics, Encryption, Databases, and math classes like Linear Algebra." It is a fantastic thing when students are able to take what they've learned in multiple classes and tie them together in pursuit of a shared goal. That reinforces their learning. The Department is proud of its students and their accomplishments. Team projects like these emphasize the inherent value of software as a service in the traditional sense and underscore the importance of Computer Science as a discipline that, at its core, helps people. Of these students, two were selected to receive the distinguished Senior Departmental Awards for Mathematics and Computer Science. Jessica Dreher won the Senior Departmental Award for Mathematics, and Jessica Pudelek won the Senior Departmental Award for Computer Science. Evidently, Spring 2014 is the semester of the Jessicas. Both students earned a perfect 4.0 GPA at Lewis. As a department, we are blessed with some of the finest students to be found at any school. Congratulations to all who were honored this semester. Ian Ziarko, a senior in Computer Science from Mokena, presented his undergraduate research work entitled "Secure Exchange of Intrusion Detection Data among Coordinating Groups" at the 2014 Meeting of the Council of Undergraduate Research (CUR). The event, which was held this year at the University of Kentucky in Lexington, is the premier event on CUR's calendar and celebrates undergraduate research from all major fields. Ian presented his work during a concurrent session to an audience of academicians, professionals, and students. It generated a lot of interest. Ian's research, which he performed under the guidance of Dr. Ray Klump, focuses on how to make electric utilities nationwide aware of an impending cyber attack. As a critical infrastructure, the nation's power grid is a ripe target for cyber terrorists, and hackers with malicious intent target utilities thousands of times each day. If any of the attacks prove successful, the consequences could be devastating. Ian's work proposes a mechanism based on the so-called "Federated Model" developed at Argonne National Laboratory to keep the network of national laboratories apprised of impending and successful attacks. Attacks tend to focus on an industry sector, on organizations that share a mission. Just like the national labs, the nation's electric utilities share a common mission; namely, to keep the lights on. They are interconnected and dependent on each other, and so an attack on one will likely lead to attacks on the others. If the attacks are allowed to spread in this way, enough of the system could be compromised to cause tremendous damage. Ian's proposed system would enable the utilities to communicate securely in real time to stop the bleeding. Not only did Ian describe the idea, but he also simulated it in software, demonstrating that it could, in fact, greatly improve the grid's ability to deal with a coordinated cyber attack. The Department of Mathematics and Computer Science is very proud of Ian and his work. It is quite an honor to be chosen to present at CUR. This speaks to the quality of Ian's accomplishment. 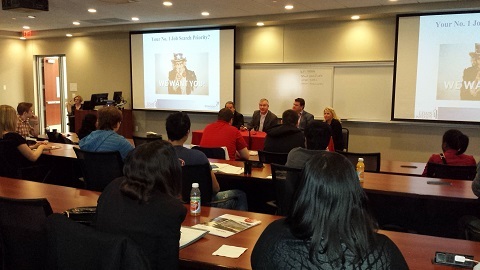 On Saturday, April 12, the Department of Mathematics and Computer Science at Lewis University was proud to host an event on behalf of the Illinois Technology Foundation entitled "Attract IT Employers and Ensure Long-Term Career Success". Over twenty high-profile industry professionals participated in panel discussions covering topics such as creating your personal brand, the importance of mentoring, how to be a life-long learner, the link between IT and organizational success, the nature of leadership, and choosing real-world success stories to emulate. Students from Lewis and from several local community colleges attended the event and had an opportunity to network with these high-profile professionals. The biggest takeaways for the students are that they are studying a subject that will enable them to be of tremendous service to others and to become impactful entrepreneurs. They simply need to learn to channel their skills into activities that align with their goals. Students were also urged to reach out to professionals and potential mentors as much as possible, because that is how the best way to ensure that opportunities come their way. The volunteers from the Illinois Technology Foundation are a tremendous group of people. They give freely of their time to pay their success forward to a new generation of potential IT leaders. The Department is so proud to have had an opportunity to help these wonderful people work with Computer Science students at Lewis and at other local schools. Computer Science and Communications Students from Lewis University visited Sprout Social, a Chicago-based social media company on March 14. The trip, which was organized by Ben Eveloff, Assistant Professor of Communications, gave students an opportunity to witness firsthand the work and culture of a fast-growing, innovative technology startup right in their own backyard. Sprout provides tools and services businesses can use to get their message out on a variety of social media platforms and to monitor all those platforms to see how their message is being received. The support Sprout provides is increasingly vital. It can be very difficult for a company to shape, convey, and monitor its message on social media networks, partly because there are so many of them. A company like Sprout requires diverse talents to achieve its mission. Without the contributions of diverse professionals, social media would not be the force that it is today, and Sprout would not be nearly as effective in helping organizations leverage it. Communications and computer science students have taken several trips together to technology startups over the past year. These are exciting opportunities for the students to see the kinds of careers they'll soon be able to pursue and the innovative and energetic work environments they'll be able to enjoy. 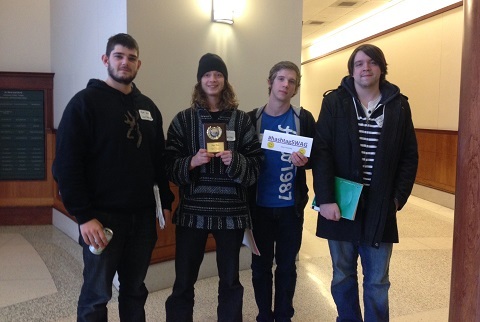 A group of four Computer Science students took home an Fifth Place Award in the annual ACCA Programming Competition on Saturday, February 22, 2014, at Olivet Nazarene University. competed in the Advanced Division against nine other teams. They completed five challenging programming problems out of a possible eight in three hours to take home the plaque. The team also won an award for best team name, #hashtagSWAG. Recursive hashtags are what #rockstars are made of. ACCA is the Associated Colleges of the Chicagoland Area. It is a consortium of fifteen private colleges and universities near Chicago that have similar educational missions. ACCA consists of multiple divisions that correspond to individual disciplines. The ACCA Computer Science division holds a number of functions throughout the year, including a Fall Seminar Series, Spring Faculty Development Seminar, and the ACCA Programming Competition. The ACCA Programming Competition is held annually in February. Teams from several of the ACCA schools work on solving problems that are more like mathematical puzzles than in-depth, multi-function programming projects. These puzzles test students' ability to devise algorithms to manipulate data and perform calculations in specific ways. Knowing how to design effective algorithms is the most important tool in a Computer Scientist's repertoire, regardless of whether they become a software engineer, networking guru, or cyber security specialist. Training for the competition and then participating provide a great experience for the students, because they get an opportunity to hone these extremely important skills as part of a team. We are very proud that Lewis teams regularly place in the top five. This year's four students are among the best and brightest students at Lewis, and we are so lucky to have them in the department. Just as important, they are a lot of fun to have around, as they bring a lot of personality to the department. A fun-loving bunch who are always willing to help others, they definitely buck the stereotype of the keep-to-yourself nerd. In that respect, they are the perfect representatives of the Computer Science program at Lewis, because that stereotype bears very little resemblance to reality in our classrooms and labs. Once again, Dr. Cindy Howard coached the team and escorted them to the competition. She is constantly involved in extra activities like this, and her dedication to helping students get the most out of their time at Lewis is inspiring. Congratulations to Ryan, Chris, Eric, Corey, and Dr. Howard on their excellent achievement at the 2014 ACCA Programming Competition. The Department of Mathematics and Computer Science hosted a community event called "Hour of Code" on December 10, 2013. 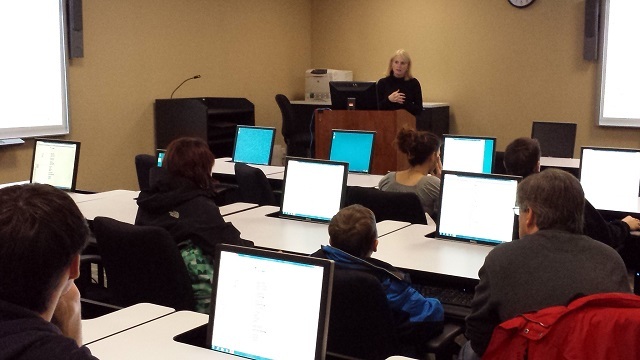 Dr. Cindy Howard offered an hour-long introduction to computer programming to area high school students, who braved the cold to visit Lewis' Computer Science wing. Several students interested in learning more about Computer Science and computer programming in particular participated in the event. 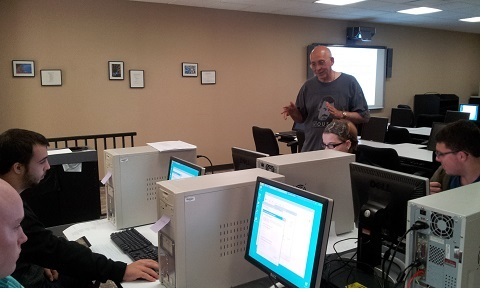 The Department offered this Hour of Code as part of the national Computer Science Education Week celebration. This initiative aims to spotlight the importance and value of developing programming skills for people from all walks of life. The week, which runs from December 9 to December 15 and was scheduled to coincide with the birthday of Grace Hopper, widely considered the first computer programmer, has featured Hour of Code events all across the country, including several that have been sponsored by tech giants like Apple, Google, and Microsoft. On Thursday, November 7, 2013, the Department of Mathematics and Computer Science welcomed Jay Johnson of Argonne National Laboratory to campus to talk with students about working in Information Technology (IT) at a national laboratory. Jay, who earned a Bachelor of Science in Computer Science from Lewis in 1998 and a Master of Science in Information Security in 2007, described the unique challenges facing IT workers at a place of Argonne's profile and stature. Because it is a national laboratory that conducts cutting-edge and potentially sensitive scientific research, it is a prime target for hackers. Consequently, every IT effort, from software development to system administration to process control to data collection and analysis, must vigilantly focus on ensuring the security of these cyber systems. Jay described the software engineering processes the developers he helps manage follow, how they continuously document and evaluate system requirements, and how they rigorously test the systems they create, particularly for the kinds of unexpected inputs cyber attackers are likely to launch at Argonne's systems. It's a tall order creating software systems that can both deliver their required functionality and keep operating securely and reliably in a constantly adversarial environment. It's Jay's and his team's efforts that help keep the lab's systems humming. 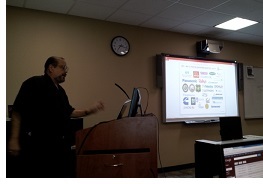 Jay gave the Computer Science students a very clear picture of the diversity of IT opportunities available to Computer Scientists, from software development to networking infrastructure to cyber security. He indicated that what the industry most needs is strong technical expertise. With its broad but deep coverage of computing theory and practice, that's precisely what Computer Science gives its students. 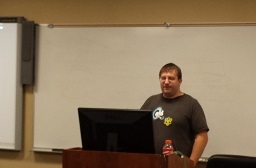 The Department of Mathematics and Computer Science at Lewis University had the honor of welcoming Computer Science alumnus Nathan Adams back to campus to speak to Prof. Joe Ninh's Linux classes this week. Nathan, who has worked at Argonne National Laboratory since graduating from Lewis in May 2010, gave an excellent presentation on powerful tools Linux system administrators use to manage their systems. Nathan described how he uses a variety of tools to perform his system administration tasks. The students, who are mostly sophomores and juniors enrolled in 70-220, benefited significantly from Nathan's talk, as they were able to see the real-world application of what they are learning in class. Nathan also shared helpful insights about the place of Linux in the industry. He cited current salary statistics that are very encouraging for Linux enthusiasts and experts. The Department is very fortunate to have such expert alumni willing to come back to campus and show students that their efforts in challenging courses such as this one will prepare them to do great work in the industry. 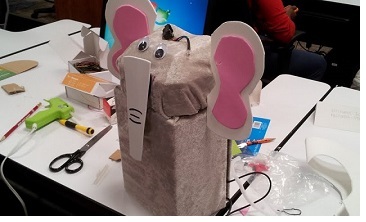 On Saturday, October 26, the Department of Mathematics and Computer Science at Lewis University offered another session of its Girls Create With Technology program. The series, sponsored by AT & T's Aspire program and led by Dr. Cindy Kersey, Assistant Professor of Computer Science, aims to introduce high school girls to the exciting field of Computer Science. In this latest session, the girls learned how to create mobile applications for Android devices using AppInventor, an easy-to-use but very powerful programming tool developed by Google and now maintained by MIT. The girls created a picture editing tool that allowed them to embellish a photo by tracing on it with their fingers, as well as a video game that involved tapping on a fast-moving on-screen mole to make it disappear. The participants were helped by Prof. Margaret Juraco and Computer Science seniors Jessica Dreher and Dave Perich. Donald Farmer, Vice President of Product Management and Qlikview Product Advocate at Pennsylvania-based Qliktech, will be giving a talk for the ACCA Computer Science Fall Seminar Series. His presentation will be held on Wednesday, November 13, will deal with clustering algorithms and recommendation systems, which are tools that enable websites to identify trends and themes in large data sets so as to pitch opportunities to visitors who are the most likely to be interested in them. Donald's presentation will be delivered via WebEx from 7pm to 9pm. 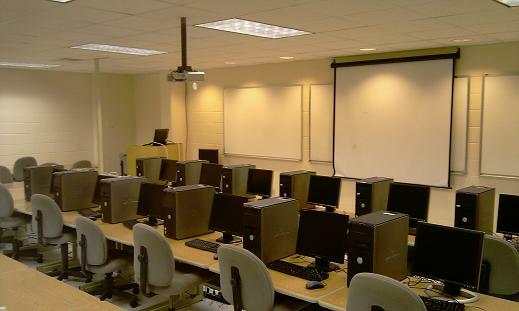 ACCA, the Associated Colleges of the Chicago Area, has a Computer Science division that annually hosts a seminar series. The series always focuses on a specific cutting-edge topic of particular interest to the industry and invites industry experts to come share their expertise in that area. In previous years, ACCA-CS has held seminar series on cloud computing, bioinformatics, video game and simulation development, and computational thought. Students and faculty from all 15 ACCA schools are invited to participate. Each year, the seminar series exposes students at these schools to important topics they would not have otherwise had a chance to study as part of their required curricula. We are especially honored this year to have Donald present his insights to us. The former Principal Project Manager for SQL Server Data Mining at Microsoft, Donald was responsible for advancing Microsoft's tools for data mining and business intelligence until he took his new leadership post at Qliktech in 2011. Since that time, Donald has been the visionary and evangelist for Qlikview's innovative data science and visualization platform, which combines top-notch data investigation tools with advanced visualization techniques that help trends and characteristics emerge from the data with unprecedented clarity. It is certainly a privilege to have a data science pioneer such as Donald Farmer share his expertise with our students. At Lewis, the Department of Mathematics and Computer Science is also quite honored to be part of the QlikView Academic Program, which gives our students an opportunity to use a leading data science tool in their coursework. For a preview of Donald's thoughts on data science and its direction in the industry, consider reading this article which provides a nice introduction to the field. On November 9, the Department of Mathematics and Computer Science will offer a unique course called "IT Career Preparation". The course, which is numbered 70-296-3, will give students an opportunity to learn the skills and approaches needed to launch and maintain a successful career in information technology. Our Computer Science students have great technical skills: they're able to program in a variety of languages, they can design and build communications networks, design and write software that uses databases, write video games and simulation software, and assess and strengthen the security of an organization's cyber infrastructure. But, technical prowess alone won't help you snag your first job, and it won't help you continue to advance in your work. The skills students will learn during this one-day seminar will help them start their new career and keep them happy and engaged as they pursue it. We are very honored and pleased to have the Illinois Technology Foundation partnering with us in offering this unique opportunity to our students. The Illinois Technology Foundation is a not-for-profit organization that aims to strengthen the IT career pipeline in Illinois. They do this by sponsoring partnerships, projects, and the annual Fifty for the Future award, which five of our Computer Science students will be awarded in November. The workshop will be held Saturday, November 9, from 9am to 4pm in Room AS-104-A. Students from any major who are interested in participating in the workshop should contact Dr. Ray Klump at klumpra at lewisu dot edu. 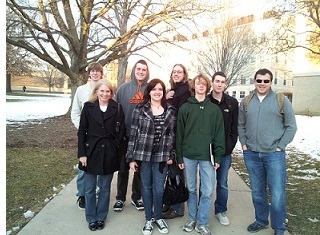 Five Lewis University Computer Science students won the prestigious "Fifty for the Future" award from the Illinois Technology Foundation for 2013. The students were awarded based on their academic performance, volunteerism, work experiences, leadership qualities, and estimated potential to be a future mover-and-shaker in information technology. With five awardees this year, Lewis Computer Science claimed a full 10% of the program's honors, which is truly phenomenal considering that hundreds of applications were received from institutions all over the state. Jessica Dreher, a senior double-major in Mathematics and Computer Science from Justice. Ryan Jessen, a senior Computer Science major, from Frankfort. Christopher Pelech, a junior Computer Science major from Joliet. David Tennant, a senior Computer Science major from Algonquin. Ian Ziarko, a senior Computer Science major from Mokena. These students join last year's three winners from Computer Science (Will Hoffman, Elie Shmayel, Brian Wilhelm) as winners of this statewide award. They will receive their awards downtown on November 12. The Department is very proud of these students. Moreover, they give us tremendous encouragement about the future, because we believe that this recognition simply heralds the great contributions these students will make during their careers in information technology. Congratulations to all. On October 4th and 5th, Lewis's Computer Science Department offered a seminar for students on the Raspberry Pi, the remarkable $35 Linux-based computer that has taken the computer hobbyist community by storm. The Raspberry Pi is a full-fledged and highly capable computer system that occupies a single circuit board. It has an ARM 11 processor running at 700 MHz, a Videocore 4 graphics processing unit capable of running HD quality video, 512 MB of RAM, 2 USB ports, an Ethernet port, and a GPIO interface to connect with other devices such as microcontrollers and sensors. Jayme Speva, an adjunct professor who has taught in the Master of Science in Information Security program for five years, created the course. Jayme is a computer specialist who works for IBM and has a passion for Linux, cyber security tools, and open-source software. He constantly looks out for new opportunities to learn interesting lessons in Computer Science. 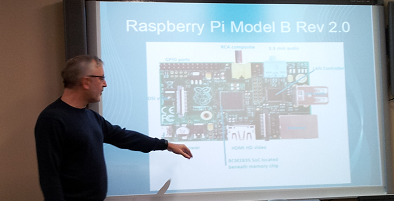 Jayme started experimenting with the Raspberry Pi about a year ago and gave a presentation to students on the cool things it can do as part of the Department's Pi Day celebration on March 14. He wrote a book for the course that described several laboratory experiments he had the students perform during the weekend seminar. 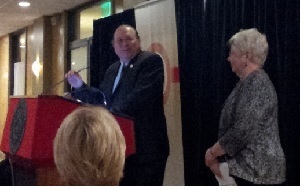 Charles "Guy" Thier was honored at Lewis University's Annual Alumni Awards Dinner. Guy, who received a Bachelor of Arts in Computer Science in 1983, won the Alumni Achievement Award in the Sciences for his impressive accomplishments in industry providing leading-edge information technology solutions to a variety of companies, including Linc Capital, Chernin's Shoes, and Bally Total Fitness. He is currently Chief Information Officer for Arbonne International, which is based in Irvine, CA. Guy is very active in the success of the Computer Science program. As an inaugural member of the Advisory Board for Computer Science at Lewis, Guy has worked with other Lewis alumni and industry executives to advise the program on how best to prepare its students for careers in information technology. He has provided valuable advice on new program initiatives and how to provide real-world project opportunities for students. Despite his extremely busy schedule, Guy has prioritized giving back to his alma mater, and we are a much better department because of his generosity. The Department of Mathematics and Computer Science expresses its most enthusiastic congratulations and gratitude to Mr. 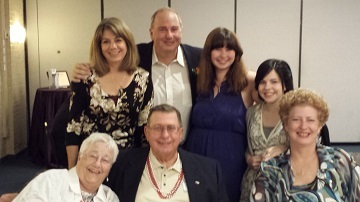 Guy Thier and his family. He's a great example of just how far a Lewis Computer Science degree can take you. On Saturday, the Math and Computer Science department held a session of the Girls Create with Technology program. This program is targeted toward high school girls who are interested in learning more about computer science. It is sponsored by AT&T through its Project Aspire, and its goal is to draw more women into this rapidly growing and increasingly vital field. In this session, we taught the girls the basics of the Python programming language. Python is a wonderful first programming language primarily because it's not limited to being a first programming language. It is powerful and full-featured enough to drive really sophisticated software systems, and there are many career opportunities for professional Python programmers. Despite its power, it is quite simple to learn. We host about nine hours worth of Python training recordings here on our website (look for the links on the left side of the page under "Python for Teachers Summer 2013"). After learning the basics of Python, we showed the girls how they could use Python to control the movements of a special robot called the Finch. There is an extension to the Python language that enables you to control the movement and beak color of the Finch and read its sensors from a program you write in Python. The girls learned these instructions so that they then could compete in navigating a Finch through a maze. Normally, controlling a Finch requires communicating with it through a USB cable, as it has no built-in Wi-Fi. 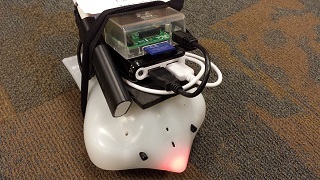 However, we made the Finch wireless by attaching a Raspberry Pi computer to the back of the Finch, along with a portable battery pack and powered USB hub. The participants then formed groups of two or three. Each team used a Windows PC to connect to the Pi over the wireless network so that they could use a keyboard to type full Python programs that could control the Finch's movements through the maze. Here's a video from the session, showing the Finches as they move through the maze. We had a busy day in the Math/CS department yesterday. Aside from our usual Thursday slate of classes, we held three extracurricular events. At 12:30, our Kappa Mu Epsilon chapter, which is the Mathematics Honors Society, held its first meeting of the year to plan its activities for this semester and to welcome the members who were inducted in April. At 5:00, our student chapter of the Association of Computing Machinery, or ACM, met for the first time this year to welcome new students to the chapter meetings, to tout the benefits of belonging to this international group of computer professionals, and to plan social, service, community, and instructional activities for the coming year. Then, at 6:00, we had a pizza party to welcome our new majors and to give them an opportunity to meet some of our Computer Science Advisory Board members. The activities ACM will pursue this year incorporate a number of interests and skills. We'll be helping Dr. Paul Kaiser refurbish old computers for economically disadvantaged communities. We'll work in conjunction with a Computer Science class to help nursing students learn how to calculate drug dosage levels. And we'll build an arcade machine based on the amazingly cool Raspberry Pi $35 hobbyist computer. Just being a member of ACM looks really good on a Computer Scientist's resume; being active in activities like these, however, shows a level of commitment and a desire to learn that will distinguish these students come job-hunt time. The pizza party we had to welcome our students to a new school year was actually the idea of one of our Advisory Board members. We are really fortunate to have such a supportive and accomplished group of people helping elevate the quality and status of our Computer Science program. Thirteen men and women who hold top positions in their companies, and most of whom are Lewis Computer Science alumni, advise us on how to keep our curriculum current with industry trends; provide money for scholarships, discretionary funds, and our endowment fund; hire our students for internships and full-time jobs; give guest lectures and tutorials and help identify other professionals for doing the same; donate equipment to stock our labs with useful instructional tools; and help promote our programs to prospective students. It turns out they now pay for pizza and pop, too! The Department of Mathematics and Computer Science is very pleased to announce the introduction of LUCSCloud, the Lewis University Computer Science Cloud, powered by Christian Brothers Services. LUCSCloud will provide students off-campus access to the same environments with which they work in the labs on campus. Up to 50 students at a time can use LUCSCloud to interact with environments specific to their classes. The cloud is already being used by our Introduction to Unix students. These students are using an Ubuntu Linux virtual machine to learn the basics of operating systems and scripting. Our graduate students in the Wireless Security course are using an installation of the popular security toolkit Backtrack to learn tools associated with wireless password cracking and discovery. 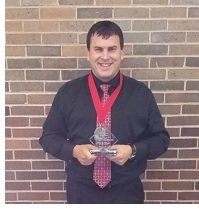 On August 16, Brandon Greene of Joliet was part of a three-person team to win the Illinois Cyber Security Challenge. Brandon is a two-time graduate of Lewis University. He received a Bachelor of Science in Computer Science in May 2011 and a Master of Science in Information Security in May 2013. The competition, which is a state-level recognition of outstanding cyber security talent and is one of the events held as part of the United States Cyber Security Challenge (USCC), consisted of several stages. Over 1,000 students representing 400 schools in the United States participating in the first round to become participants in the the USCC. Once Brandon qualified, he was asked to do a forensic analysis of network traffic documented in a packet capture (pcap) file. He had only 24 hours to examine the data and answer questions about the nature of the intrusion depicted in the file. After correctly responding to these questions, Brandon moved to the next round, which required him to write an essay explaining why he wished to participate in the USCC. Of all competitors in Illinois, Brandon's work in these stages qualified him to be among the 30 students to compete in the Illinois Summer Cyber Camp, which was held August 12 - 16 at Moraine Valley Community College. At the Summer Cyber Camp, the thirty qualifiers received boot-camp style instruction for four days. Each day featured a different course that normally would span a week. The instruction covered the theory and practice of topics such as social engineering, Android penetration testing, network forensics and analysis, and tactical attacks. At the end of the fourth day, the students participated in the final phase of the competition, a capture-the-flag contest. For this part, the participants were divided into ten teams of three people and were charged with the task of recovering specific secret data from a supposedly secure system. Brandon's team won first place. This is a tremendous honor for Brandon. 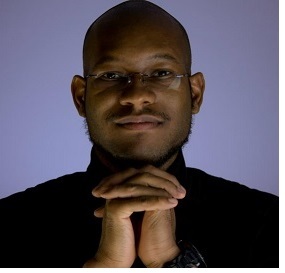 He is an extremely talented cyber security professional whose skills are matched only by his genuine curiosity. He is also one of the friendliest, kindest, and most helpful people you could ever meet. Furthermore, he's really enthusiastic about and supportive of Computer Science at Lewis, having served as president of the department's social club, Prometheon, for several years and serving as a volunteer tutor for current computer science students. The Department of Mathematics and Computer Science is very proud of Brandon Greene and thrilled for his success. There will be a lot more to come! Two Lewis University Computer Science students presented research they did this summer as part of the university's Summer Undergraduate Research Experience (SURE). Ian Ziarko of Mokena presented a project entitled "Secure Exchange of Intrusion Detection Data among Coordinating Groups". Ryan Jessen of New Lenox presented a project entitled "Using Your Phone as an I-Pass Replacement". Ian's work was guided by Dr. Ray Klump, Professor and Chair of Mathematics and Computer Science and Director of the Master of Science in Information Security Program. Ian designed and implemented a distributed intrusion detection system which groups of organizations that share a common mission could use to alert each other to nefarious network activity. For example, electric utilities share a mission to keep our lights on. If a cyber attack befalls one of them, it would be nice if the other utilities could be alerted in real time that a problem has occurred elsewhere that may end up impacting them. With this advance warning, the other utilities can set up firewall rules to block the kind of traffic that compromised their peer. The result is that the problem becomes contained rather than spreading across the entire electrical grid. The impact of the cyber attack is greatly minimized. Ryan was mentored by Dr. Cindy Kersey, Assistant Professor of Mathematics and Computer Science. Ryan developed an Android app called L-Pass that could serve as a viable replacement for the I-Pass and other toll transponders. His app uses GPS coordinates to determine when the owner has passed another toll. The toll is then automatically deducted from the person's L-Pass account. The idea for this app came from Rick Hammer, Track and Field coach at Lewis, who thought of it as he took an interstate trip with his players and noted that each state used a different kind of transponder for tracking tolls. If tolls could be managed using a smart phone instead, however, out-of-state drivers could more easily pay them and avoid causing traffic jams at the manual booths. Ryan's app proved that this concept would work. He tested it on the Illinois tollway and on a simulated tollway he mapped out on the Lewis campus. Congratulations to Ian and Ryan for their exemplary work this summer! The Department of Mathematics and Computer Science at Lewis had the privilege of offering beginning Computer Science education to 22 high school girls through a program called "Girls Create with Technology". This magnificent opportunity, which was led by Dr. Cindy Kersey, Assistant Professor of Computer Science, was funded by a generous $25,000 grant from AT&T through their Aspire program. The grant covers four days of training this week plus several follow-up activities with the girls on weekends during the school year. Participants will be introduced to the dynamic field of Computer Science through exercises designed to teach them how to program computers, how to build and program robots, and how to communicate and secure data. It's a wonderful opportunity for these young women, and we are honored to be the host site for it. You can read more about the camp and see videos of the girls' final projects at the Girls Create with Technology page. The Department of Mathematics and Computer Science recently had the pleasure of hosting two unique summer camps for high school students interested in Computer Science. The camps were part of the Department's effort to expose more young people to the field that has had a most profound impact on how we live, work, and play. The first camp, which was called Camp Code, lasted three days. During that time, the participants learned a number of very useful tasks: how to develop a plan for accomplishing a task, how to turn that plan into steps a computer could follow, how to express those steps in a variety of computer languages, and how to make robots move using computer code. The students used Scratch (http://scratch.mit.edu) to create programs visually. These exercises helped them understand that thinking like a programmer involves breaking complicated problems down into smaller parts and then using sequence, selection, and repetition to implement solutions to each part. They used a version of Scratch called Snap (http://www.finchrobot.com/software/birdbrain-snap-v02-alpha) to express commands for a Finch robot (http://www.finchrobot.com/) to follow. Later in the camp, the students moved away from these graphical programming approaches and started writing actual computer code in Visual Basic, PHP, and Python. It was a lot of material for three days, to be sure. By the end of it, however, the students had learned some very useful skills. More importantly, they had gotten practice solving complicated problems methodically. That is what Computer Scientists do for a living, and that is what makes them valuable in virtually every field. The second camp was called "Guardians of Cyber Space". 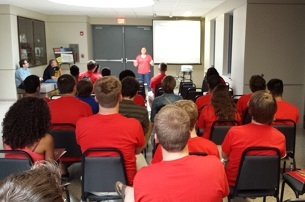 During its two-day run, the campers learned the basics of cyber security. The camp began with an explanation of how our country's critical infrastructures, like the electric power grid, are currently under cyber attack. They learned about the various threats that bring down computers and networks of all varieties. Then they learned about the various tools that we have at our disposal to help protect us from cyber attacks, including various techniques for encrypting data, applying digital signatures to documents, and checking the validity of data and software using hash functions. They learned about SQL injection attacks against databases and how to guard against those. They played with tools for recovering forgotten passwords, and they learned about how to make password systems stronger. They even got to set up their own miniature computer network and modify IP tables to control access to the internal network and to the Internet. The campers really seemed to enjoy these hands-on activities. The Bureau of Labor Statistic predicts that there will be 270,000 new Computer Science jobs by 2020. Somebody has to fill those jobs. The high schoolers who attended our camps this week will be ready. For the third year in a row, the Green and Renewable Energy Workshop (GREW) was held at Lewis University. 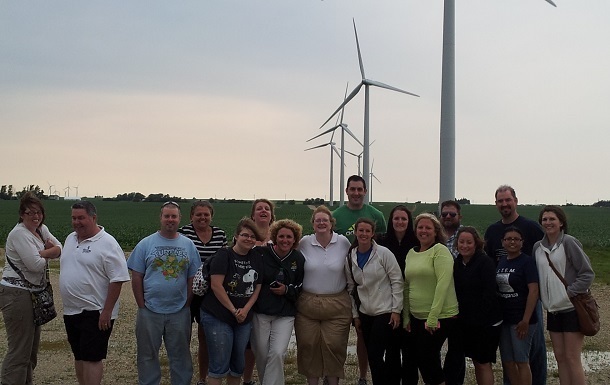 A collaboration between middle-school teachers in the Joliet 86 School District and Lewis faculty in the College of Arts and Sciences and the College of Education, the two-week workshop aimed to provide teachers from all disciplines ideas and techniques for increasing their studentsí achievement by working with issues related to sustainability and green energy. Twenty-five teachers from Gompers Junior High in Joliet participated in this yearís event, which was held in the new Science Center from June 17 to June 27. The participants represent many different departments at Gompers, including Math, Science, Social Studies, Language Arts, Health, and Art. They worked with Lewis faculty from the Sciences and Education on a variety of activities, including lecture-and-discussion sessions, hands-on laboratory experiments, group presentations, and field trips. The overarching goal of these sessions was to increase the teachersí understanding of green and renewable energy issues while giving them ideas for teaching the essential content of their classes using these issues as a context. The program was led by Dr. Ray Klump, Chair and Professor of Mathematics and Computer Science, and Dr. Lauren Rentfro, Assistant Professor of Secondary Education. Among the many activities the teachers enjoyed during the workshop, they had an opportunity to write computer programs in Scratch and Python as well as to learn about the basics of cyber security. Specifically, they learned how encryption and authentication relate to the security of the electrical grid. They also visited several sites, including Argonne National Laboratory, a wind farm in Shabonna, Illinois, the ComEd Training Facility in Rockford, and the Thanks Jordan Raw Vegan CafÈ in Lockport. 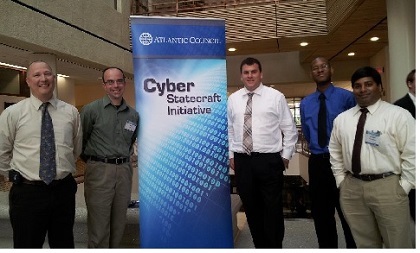 Three Lewis University students participated in the Cyber 9/12 Student Challenge, sponsored by the Atlantic Council. The Cyber 9/12 Student Challenge is a national competition that tests students' ability to craft high-level policy recommendations for dealing with a major cyber threat. This is Lewis' first time participating in the competition. Only fifteen schools from around the country qualified to participate. The competition consisted of two parts. In the first part, the students wrote a 2,500-word policy brief that recommended to the President a strategy for dealing with a hypothetical but plausible threat to a vital component of the nation's critical infrastructure. Then, on June 15, the students presented their recommendations to a panel of judges at American University in Washington, D.C. On that day, the students presented the components of their plan, identifying the strengths, weaknesses, opportunities, and threats of their various recommendations. They were then presented with new information related to the incident and were challenged to revise their recommendations in light of how the situation had evolved. They presented their revised plan in the afternoon. Their overall performance for the competition was evaluated in terms of the quality of their written policy brief and two oral presentations. The students who participated were Brandon Greene of Joliet, Joseph Kunnengode of Hickory Hills, and Brian Wilhelm of New Lenox. 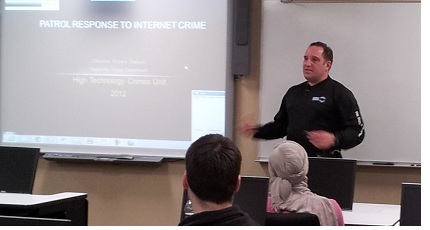 Brandon graduated from Lewis with a Bachelor's degree in Computer Science degree in 2011 and a Master of Science in Information Security degree in May 2013. Brian graduated from Lewis with a Bachelor's degree in Computer Science in December 2012. Both Joe and Brian are currently pursuing the Master of Science in Information Security (MSIS) degree from Lewis and are on track to graduate within a year. 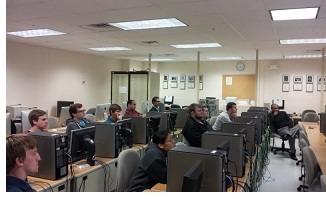 The students were advised by Dr. Ray Klump, Professor and Chair of the Department of Mathematics and Computer Science and Director of the Master of Science in Information Security program, and Matt Kwiatkowski, Deputy Information Security Officer at Argonne National Laboratory and an instructor for several courses in the MSIS program. The Lewis team competed against teams from MIT, Harvard, Columbia, William and Mary, Georgetown, Johns Hopkins, and the Air Force, as well as several other universities from around the country. The team's travels were generously funded by Deltak, an online education firm who helps develop, market, and deliver the MSIS program to students across the country. One of the key lessons of the competition is that cyber security is an inherently interdisciplinary concern. The threats are multifaceted, and the stakes are high. Responding to them requires a team of people with diverse skills. Computer Scientists work alongside policy makers, legal experts, and political strategists to identify, measure, and respond to risks and threats. A comprehensive security posture, particularly as it relates to national security, requires a team of talented people in each of these areas. The nature of this competition clearly conveyed that point. Lewis University has been recognized by the NSA and DHS as a Center of Academic Excellence in Information Assurance Education. It graduate Information Security program is complemented by a high-quality undergraduate program in Computer Science, which includes a Concentration in Cyber Security Operations. A fast-track program enables Computer Science majors to earn their Masters in Information Security and Bachelors in Computer Science in just five years. "This was a wonderful exercise for our students to participate in," said Dr. Klump. It gave them an opportunity to use what they have learned in their coursework and to work as a team to solve a very complex information security challenge. The students did amazing work, and the judges were impressed." 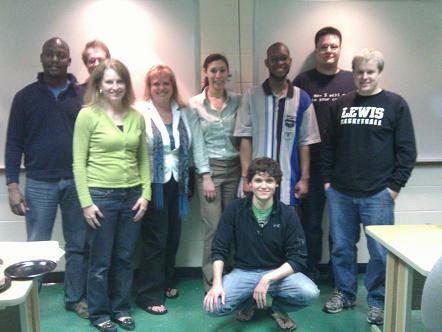 Dr. Cindy Kersey led a team of Computer Science students in working on a variety of advanced mobile applications during the Spring 2013 semester. The work Dr. Kersey and her students did was performed as part of CS 496: Special Topics - Advanced Mobile Application Development. The course provided a follow-up opportunity for students who had previously taken CS 417: Mobile Application Development to develop commercial-grade mobile applications for a variety of customers. This app allows a user to track attendance via NFC tags. Students use NFC stickers or IDs to check in via an instructor's Android device. The application also allows for manual check-in should the NFC malfunction. Attendance data is maintained in an online databases and various statistics are available to the instructor. The app quizzes students using multiple choice and fill-in the blank quizzes. The questions can include an image which is useful in Anatomy courses. The authoring tool is an online tool that allows instructors to create quizzes for their students and track student scores. This app was developed for the Diocese. It has four sections, which are shown in the image above. 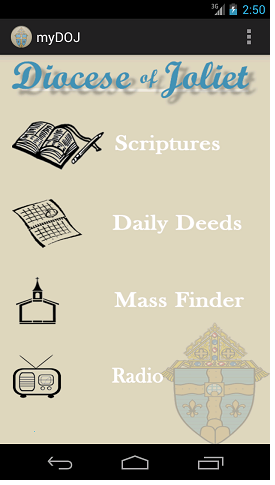 "Scriptures" provides daily scripture readings; "Mass Finder" uses Google map functionality to display the location of local parishes and the users current location; "Radio" provides a link for listening to Relevant Radio online; and "Daily Deeds Tracker" allows users to create a list of good deed to perform and awards points for completing these deeds on a daily basis. These were rather sophisticated development projects, and the students rose to the challenge. Dr. Kersey also had her CS 440: Software Engineering class support this work by gathering requirements and expressing them in detailed technical requirements documents. This is an example of the kind of real-world work Computer Science students at Lewis learn how to do. These activities prepare them well for the projects they'll take on as they start their careers. Nineteen students and faculty were inducted into Lewis' chapter of Kappa Mu Epsilon, a specialized honors society in Mathematics, on Friday, May 3, 2013. Prof. Margaret Juraco and Br. Tom Dupre led the induction ceremony, during which the new initiates signed the roll and became official members of this prestigious organization. Lewis' chapter of KME, which now has 90 members, invites guest speakers in mathematics to campus, leads math tutoring efforts, and organizes a number of other math-focused initiatives on campus. Congratulations to the new initiates: Jacqueline Argenbright, Vanessa Basick, Amy Choi, Jessica Dreher, Ramica Ford, Jeremy Gregory, Caitlin Hodgson, James Hofmann, Ernest Knight, Erica Kwiatkowski-Egizio, Sarah Massoglia, Alessandro Mazza, Cassandra Myers, Steven Neubauer, Alec Pickett, Elie Shmayel, Piotr Szczurek, Christopher Troxell, and Andrea Veeneman. The College of Arts and Sciences held its Senior Honors Awards ceremony for Spring 2013 on Tuesday, April 23. 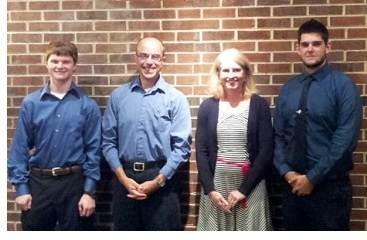 The Departmental of Mathematics and Computer Science awarded two outstanding seniors. Shannon Ott of Oak Lawn won the departmental award for Computer Science, and Jeremy Gregory of Crest Hill won the departmental award for mathematics. To qualify for the award, Shannon and Jeremy had to earn a cumulative GPA greater than 3.5 and be judged worthy of the department's top awards in terms of their character, service, and career potential. Shannon and Jeremy are excellent representatives of what the Department of Mathematics and Computer Science have to offer. Congratulations to both of them. 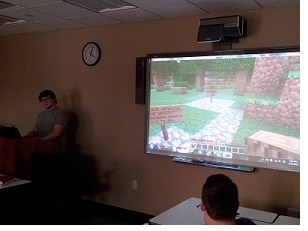 Josh Brauer, a senior Computer Science major from Plainfield and an officer in the Prometheon Technology Club, gave an engaging presentation on advanced Minecraft construction. He demonstrated a level he built that includes a lot of redstone and pistons. One feature of his level was a room that included implementations of AND, OR, NOT, and XOR gates, demonstrating how rich a programming environment Minecraft can be. 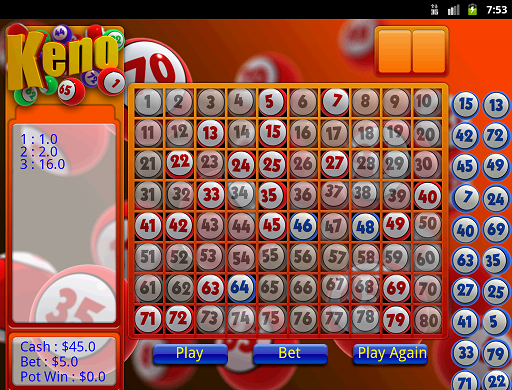 It is an example of how great software can be entertaining, educational, and a way to inspire and express creativity. 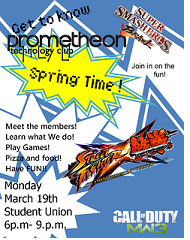 The Prometheon Technology Club is a registered student organization at Lewis that was founded in 2005 by a group of Computer Science students. It a group open to all majors who are interested in computers, video games, and other forms of electronic technology. Now in its eighth year, Prometheon continues to involve students in activities that foster their interest in technology. 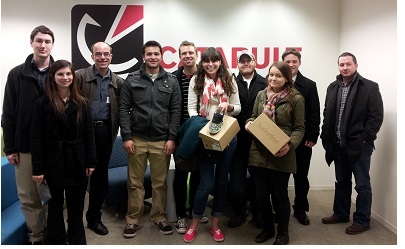 A group of Computer Science majors and Communications majors visited the downtown Chicago tech incubator Catapult on Friday, April 19. The trip was coordinated by Prof. Ben Eveloff and Dr. Ray Klump. The students had an opportunity to witness first hand the environment at a cutting-edge hub for entrepreneurialism and innovation, particularly in the technology space. The students learned that entrepreneurialism is simply the expression and implementation of an idea about which you're passionate. It doesn't start with a business plan. Rather, it starts with technical expertise and an exciting way to apply it. Ideas that catch fire then become the basis of a company. Catapult provides a home where such companies can grow from small initiatives with few employees to larger organizations that graduate into their own space. While at Catapult, employees from these developing companies can mingle and share ideas and advice in a relaxed, casual atmosphere on the 25th floor of a building with a magnificient view. It was a really worthwhile trip, because it gave students a rather clear picture of how their computer science and electronic communications skills provide part of what they need to create or be part of a startup like the ones Catapult hosts. Now they simply need the inspiration! Computer Science Alumnus Gives Presentation "CompSci Rules!" 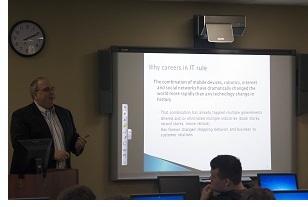 Guy Thier, Senior Vice-President and Chief Information Officer for Bally's Total Fitness, a billion-dollar international company in the health and fitness sector, gave a presentation to students and faculty of the department entitled "CompSci Rules!". You can download the slides for the presentation here. Thier, an alumnus of Lewis' Computer Science department from 1983, emphasized to students that, as Computer Science majors, they have skills and problem solving approaches that nobody else has. They have a unique aptitude to learn new things and adapt new technologies to old, unsolved problems. Guy shared with them that, because of their unique gifts, they are uniquely poised to be the entrepreneurs and innovators, the people who create tomorrow's next big thing. They are the people who can revolutionize the way we live, work, communicate, and play. His message was inspiring, yet grounded. Because Computer Science focuses almost entirely on solving problems, it equips students with the ability to make a tremendously helpful impact on their fellow citizens. All a Computer Science student has to do is a look around him or her for ways to do things better. Another focus of Guy's presentation was to give practical tips on how Lewis Computer Science students could differentiate themselves in the job market. The good news is that, of all the fields, Computer Science has the second lowest unemployment rate of any discipline. However, to distinguish themselves, Guy encouraged students to hone their technical chops while making every effort to improve their communication skills and remaining forever inquisitive and deep-thinking about their surroundings. Students and faculty left with a real sense that what they're studying - Computer Science - is the best thing going. The Department of Mathematics and Computer Science was honored to welcome Mr. Bob Bersano, Senior Software Engineer and Product Architect with Rocket Software, to Lewis on April 15. Bob, who lives in Joliet and is the father of Lacey Bersano, one of our graduating Computer Science majors, talked about the twists and turns his career has taken. After starting out as a Business major, Bob realized he wanted to solve a wider array of problems using his mathematical prowess and ingenuity, and so he switched to studying Computer Science. He soon was able to snag an internship at Argonne National Laboratory, where he got his first taste of developing software for solving specific problems. After Argonne, Bob worked in the telecommunications industry for a while and started developing expertise in IBM's database platform DB2. He began to develop tools for DB2 for various companies, including a startup firm that was bought up by IBM. Several years ago, through one of the many contacts he has made, Bob went to work for Rocket, which makes extremely high-speed backup software for the DB2 platform. Rocket is an IBM business partner, and they look closely together to meet customers' needs. Interestingly, much of Rocket's software is written in IBM Assembler, which demonstrates how sometimes the "old way" of doing things is still very much current. In addition to writing software, Bob gives a number of presentations and demonstrations annually, and he gets to travel a lot. Bob gave a very interesting presentation about his career, and the Department is grateful for the time he spent with us. 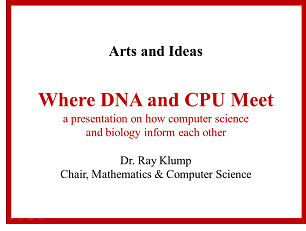 As part of an Arts and Ideas series celebrating the 60th Anniversary of Watson and Crick's discovery of the DNA double helix, Dr. Ray Klump, Professor and Chair of Mathematics and Computer Science, gave a presentation on entitled "Where DNA and CPU Meet: a presentation on how computer science and biology inform each other" on April 10, 2013. You can download the presentation here. Computer Science is increasingly be applied to solve problems that are otherwise unsolvable and areas that are otherwise unexplorable. Through computer simulation and mathematical modeling, scientists from all fields can interact with models that capture critical aspects of a problem or system, identify new issues of focus, ask probing new questions, and draw new and potentially transformative collisions. Perhaps nowhere else is this interplay between computer science and other fields as promising as it is in the biological sciences. Thanks to sophisticated computer algorithms, cutting edge software, and new parallel computing architectures, scientists were able to sequence the 3 billion bases of a human's DNA as part of the 13-year-long human genome project. That same process can be done today for an individual in about a day. And the benefits of this work are tremdous. By tailoring the right medicine to a particular patient based on his or her DNA, doctors can prescribe treatments that have a better chance of working. The days of personalized medicine are rapidly approaching, and much of that promise is thanks to Computer Scientists. March 14, otherwise known as "Pi Day", was a rather active day in the Department of Mathematics and Computer Science. In the morning, the Department served pie (of course) to students walking through the new Math / Computer Science wing. In the afternoon, starting shortly after 1:59:26, about twenty students attended an outstanding lecture and demonstration by Mr. Jayme Speva, an adjunct instructor for some of the Department's courses in the Master of Science in Information Security Program, on an exciting new hobbyist computing platform called the Raspberry Pi. The Raspberry Pi was introduced a little over a year ago. It is a $35 Linux-based computer that is remarkably powerful and flexible. Jayme demonstrated some of the things you can do with a Raspberry Pi, and he provided a preview of a weekend seminar he'll be giving on November 1st and 2nd this year to Computer Science students. What is wonderful about the Raspberry Pi is that it harkens back to the day when computer science was a hobby pursued by kids. Those kids grew up with the technology and went on to do great things because they were there when the home computer revolution began. This product ushers in a similar kind of zeal and potential, and Jayme's presentation conveyed that. After Jayme's presentation, we had the honor of awarding a brand new scholarship to a Computer Science student. Dr. Dana Dominiak, founder and president of Webfoot Technologies, a Lewis alumnus, and a member of Lewis' Advisory Board for Computer Science, has funded the first scholarship dedicated specifically to Computer Science. This scholarship will be awarded annually on Pi Day. One of the requirements for the scholarship is that the recipient's GPA exceed 3.14. This year's winner was Will Hoffman, a senior in Computer Science from Lockport. The Department wishes to thank Jayme Speva for his excellent presentation and Dr. Dominiak for her generosity, and to congratulate Will on his award. 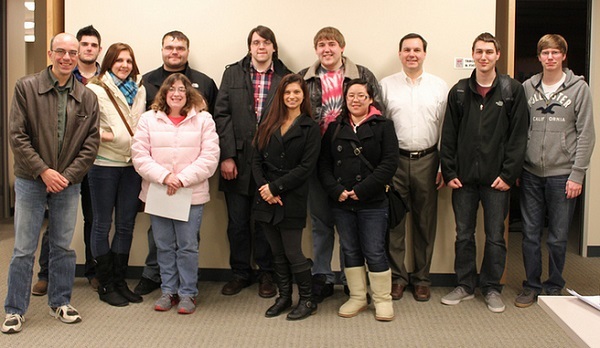 On February 27, Geneca, an enterprise software development firm, hosted Computer Science students and faculty at their office in Oak Brook. The trip was arranged by Dave Katauskus, a Lewis Computer Science alumnus from 1996 and current Computer Science Advisory Board member. Dave is the Chief Technology Officer for Geneca. Several Geneca employees talked with the students about a variety of topics. Mike Denton, another Lewis alumnus who heads recruitment efforts at Geneca, talked about job search and interview skills and gave the students a lot of very practical, timely tips for making a good impression during an interview. Other presenters talked "tech" with the students, describing Geneca's software development process, including software architectural details and patterns the students have seen in their software engineering course. The Geneca team even provided dinner for the students. This trip was a tremendous opportunity for Lewis Computer Science students to network with current software developers, see the real-world application of what they're learning in the classroom, learn how to search for a job and position themselves for opportunities, and meet relatively recent Lewis graduates who have had a tremendous impact in the computer industry. The Department is very grateful to the Lewis alumni and other "Genecians" who made this great afternoon possible. 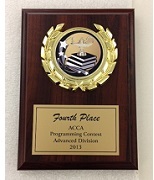 Seven Computer Science students participated in the annual ACCA programming competition. Vanessa Basick, Jessica Dreher, Ryan Jessen, Jose Marquez, Chris Pelech, Eric Raber, and Corey Wagemann spent Saturday, February 23rd, writing C++ code to solve a variety of mathematical problems and logic puzzles. In fact, the team of Jose, Chris, and Eric took home fourth place in the Advanced Competition. In addition to competing Saturday, the students spent time training with their coaches, Dr. Cindy Kersey and Dr. Piotr Szczurek, for the past few weeks, learning how to solve complicated programming puzzles as a team. The Department is very proud of these seven students and is grateful that they represented the department so well. Students in Dr. Klump's Video Game Programming II course (70-415) visited Computer Science alumnus Dr. Dana Dominiak and her video game development company Webfoot Technologies on February 14, 2013. The students were given a tour of the facility and got a chance to see how Webfoot develops games for a variety of gaming platforms. They were able to discuss how artists and programmers interact, how developers distribute their work independently and through publishers, how code is written and maintained for multiple platforms, how ideas are marketed, how important C++ and OpenGL are to what Webfoot does, and how a business in a very cyclical market can navigate the ups and downs of sales trends. It was very gracious of Dr. Dominiak to open her company's doors to us, because it gave a real-world connection to what the students are learning in class. 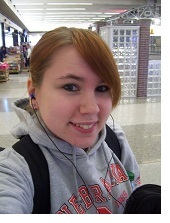 Tiffany Parks of Joliet, a Math Major at Lewis, attended the Nebraska Conference for Undergraduate Women in Mathematics January 25-27, 2013, in Lincoln, Nebraska. The purpose of the conference was to gather women interested in pursuing advanced study and careers in the mathematical sciences. The conference featured presentations on original research done by female mathematicians throughout the country. " I was able to speak to quite a few mathematicians and see some really interesting research projects," Tiffany remarked. "It made me think about if there was any research projects I would be interested in, as well as summer programs and graduate school." This is the second year Lewis has sent students to this conference, and we hope to continue to do so next year. John Chmela, an 1983 Lewis graduate in Computer Science, gave a guest presentation in Dr. Cindy Kersey's mobile application development class on Thursday, January 24, 2013. John, who has launched a number of innovative technology initiatives over the course of his career, enthusiastically presented his latest creation, a technology called ZippyQ, which transforms those QR codes that are popping up everywhere into powerful channels for communicating rich content. John even left the department several dozen of his ZippyQ cards that he encouraged students to use to start sharing their information with othes. John is a renowned expert in developing social media tools that effectively reach the multitasker. He is also a tremendous and generous philanthropist who has spearheaded a number of impactful efforts, particularly in the area of bridging the digital divide. His presentation to students and faculty was very inspiring. "You guys are in the right place. The opportunities in 1983 were nothing compared to what you can do today. You guys are exactly in the right field," he told the students. This could not be a better time to major in Computer Science. Fifteen Master of Science in Information Security students presented their capstone projects this semester as part of 68-595: Information Security Capstone. The course gives graduating MS Information Security students an opportunity to tie much of what they've learned in prior coursework together in the context of solving a real-world problem related to information security. The students did excellent, innovative work in a number of different areas of the information security discipline. Posted here are some of the best papers written this semester. They include works by Muhanned Alaqili, Shaila Aziz, Michael Dellert, Sanjiv Kalkar, Joel Keller, Bob Kukla, Floyd Martinez, Joseph Moore, Jorel Viray, Wes White, Kevin Wood, and Faisal Zhrani. Dr. Paul Kaiser, Professor Emeritus of Mathematics and Computer Science, and his wife Kathy received the Frank J. Lewis Philanthropists of the Year Award on Friday, December 7. The award is given annually to people whose generosity to the University is exemplary, and that certainly describes the Kaisers' involvement with and support of Lewis over nearly 40 years. As a professor in the Mathematics and Science department, Paul has prepared thousands of mathematicians and computer science, including many who now are leaders in the industry. He is also a former Chair of the Department, a former Dean of Students, and a former Dean of the College of Arts and Sciences. Kathy has selflessly worked as a community organizer and social worker in the Joliet area, supporting the disadvantaged in numerous ways. Together, Paul and Kathy provide the perfect example of selfless dedication to helping improve the lives of others. We are so fortunate to have them as heads of the Lewis Math / Computer Science family. We are in the midst of a revolution in Computer Science circles in terms of how data are stored and accessed. More and more of our data are being stored in an Internet-accessible way in "the cloud". The Computer Science program has added coursework on cloud computing and virtualization to its curriculum, and it's going to become an increasing focus over the upcoming semesters. That is why we were so honored and excited to welcome Paul Young, Founder and Chief Architectural Officer of CloudOne. Paul gave an extremely interesting talk on his experieces creating a company that serves a very special niche in the industry: delivering IBM Rational development tools to thousands of developers around the world in the cloud. Paul mixed technical detail with captivating narrative on the trials and tribulations of building a startup from scratch. 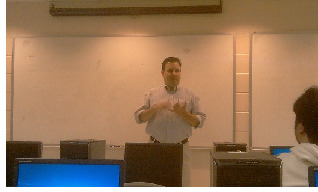 Paul was the sixth industry professional to visit our students and faculty during the Fall 2012 semester! We are very grateful to Paul for sharing his expertise and story with us. Students in Math 135: History of Mathematics for Elementary School Teachers presented creative projects on how to teach the wonderful stories of how math has been devloped over the centuries to grade school students. 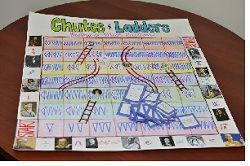 Under the guidance of their instructor, Professor Margaret Juraco, the students applied their creativity and artistic talents to create engaging games, scrapbooks, and displays ideal for elementary and grade school classrooms. You can see samples of their work here. Brian Wilhelm (pictured) and Martin Strus won the Departmental Awards for the Department of Mathematics and Computer Science for Fall 2012. 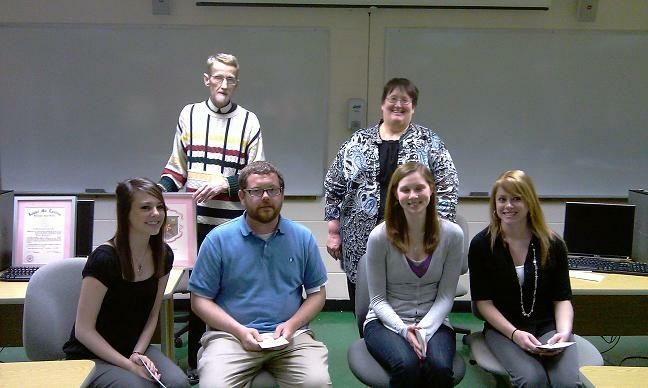 The Departmental Award is the highest award given to a student in each major at Lewis. The recipient of the Departmental Award must have a GPA greater than 3.5 and must represent his or her academic department well in all respects, including character, potential, integrity, and service. Brian was awarded the honor for Computer Science, and Martin won it for Mathematics. 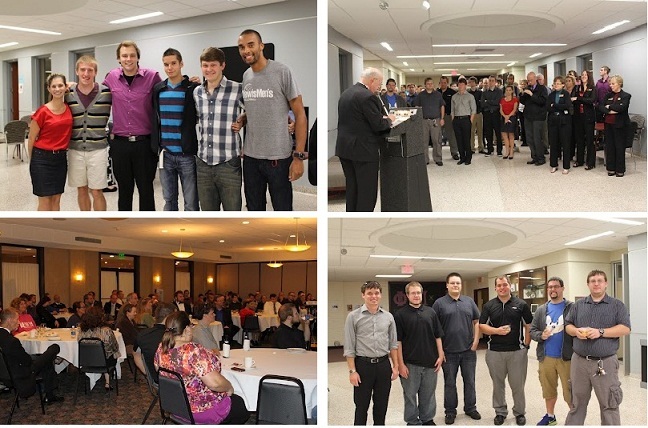 The ceremony took place at the College of Arts and Sciences Senior Honors ceremony on November 27, 2012, at St. Charles Borromeo Pastoral Center. Brian and Martin will be graduating on December 16, 2012. Congratulations to Brian and Martin. Art Scheuber, a 1981 alumnus of Lewis' Computer Science program, came back to his alma mater to discuss the benefits studying Computer Science has given him throughout his career. Art is currently the Vice-President for Administration at Marquette University, where he has worked since 1996. In his role as an Administrator in charge of a broad set of services and programs at the university, Art has used his keen problem-solving ability, something borne of his background as a computer scientist and particularly as a programmer, to tackle many complex issues, including those related to student safety, sustainability, and telecommunications. Art's presentation was inspiring in the sense that, although their studies are often quite challenging, students are slowly but surely becoming increasingly adept at solving complex problems in ways that students in less problem-focused majors might not be. We also learned to expect the unexpected when it comes to the twists and turns our careers may take. It was great to have Art Scheuber back to campus to share his wealth of experiences. Nathan Adams, a software engineer at Argonne National Laboratory and a 2010 graduate of Lewis' Computer Science program, gave a talk to students and faculty on November 15, 2012, on the topic of reverse engineering. Reverse engineering is a computer science technique of deducing programming code from compiled software executables and the content of communications from network traffic, even when that traffic might be encrypted between its two endpoints. Nathan's talk was thoroughly researched, and he shared a number of excellent free and commercial tools for recovering source code and communications, including Wireshark, IDA Pro Free, Dotpeek, Disasm, OllyDbg, and Fiddler. Nathan presented these concepts and tools during Professor Ninh's File Systems and Digital Forensics course, which gives students a thorough understanding of how data are stored in files and how to recover data that has been hidden within such systems. You can download a copy of Nathan's slides if you would like to learn more. 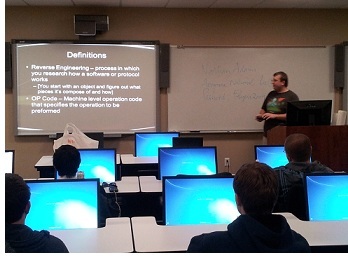 We are grateful that Nathan returned to campus to share his expertise with our Computer Science students and faculty. Tom Sakkos, Software Engineer at NetherRealm Studios, Chicago-based maker of Mortal Kombat and other popular video game titles, gave inspiring presentations in two Computer Science courses today, 70-410: Video Game Programming I and 70-330: Database Systems. In both talks, Tom talked about what it's like to work in the gaming industry and how teams of programmers collaborate on these complicated systems. He also managed to make all of us more than a bit jealous of the cool environment in which they work. To both classes, he emphasized how important it is for the students to work not just on their assignments for their courses, but also on side projects that they see to fruition. In the video game class, Tom discussed the performance benefits of C++, how polymorphism is used to develop games for both the PS3 and the XBox, and the intricacies of memory management. In the database class, Tom explained how important both key-value and relational databases are used for in-game logic and the numerous game development tools they use at NetherRealm. We are very grateful for Tom's visit and his great presentations, and we hope to have him back soon. 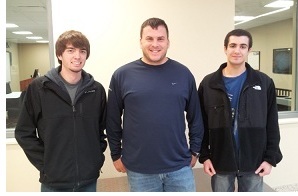 Three Lewis Computer Science students were awarded witht he presitigious Fifty for the Future Award for 2012. The award, which is given by the Illinois Technology Foundation, "recognizes exceptional students with an interest in and potential to use technology in innovative ways." CompSci students Will Hoffman, Elie Shmayel, and Brian Wilhelm received the award at a ceremony Mesirow Financial in downtown Chicago on Tuesday, October 23, along with other honorees from schools across Illinois. With three awardees, Lewis' Computer Science department was one of the most recognized programs at the event, which is a testament to the high quality of our Computer Science curriculum and our students. Will, Elie, and Brian were chosen through a rigorous selection process that sought to evaluate the prsent accomplishments as well as their potential for future contributions to the field. The Department is very proud to have these students studying Computer Science here, and we all look forward to reading about their inevitable future successes. 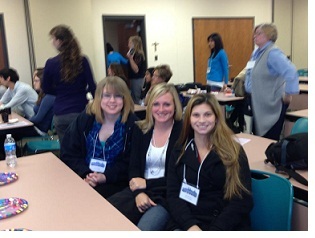 Dr. Cindy Kersey and a team of Lewis Computer Science students and alumni attended the Chicago Women in Computing conference (CHIWIC) on Saturday, October 26 and 27. Computer Science Majors Lacey Bersano, Jessica Dreher, and Sam Payne joined alumni Trina McNamara, Michelle Mikka-Van Der Stuyf and Dana Dominiak at the conference, which explored ways to attract more young women to this exciting and well-paying field. Computer Science is the STEM area in which the pay difference between men and women is smallest, but it also is the field in which the percentage of women is among the least. That has to change. Conferences like CHIWIC help emphasize the need for this change and brainstorm on ways to make it happen. The Lewis Department of Mathematics and Computer Science department has experienced impressive growth in the number of female Computer Science majors over the past few years, but we are looking for ways to continue and accelerate that trend. We will continue participating and hopefully leading efforts like this in the future. Just in time for Halloween ... 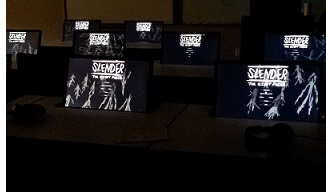 The Prometheon Technology Club held a tournament centered on the popular psychological horror game Slender on Monday, October 29. The event, which was held in the dark in one of the Computer Science labs from 8 to 11pm, was an immersive and thrilling experience, made all the more so by having ten to fifteen players all playing the game at once. It was a really fun time and a good chance for Prometheon to celebrate what makes its club so cool: a passion for using technology to entertain and build camaraderie. There will be more events like this in the coming months, so look out. The Lewis University chapter of the ACM (Association for Computing Machinery), a student group consisting of undergraduate students in Computer Science and Masters students in Information Security, held a workshop on Saturday, October 27, to teach grade school children and their parents how to program. This activity was part of a larger event put on by the undergraduate researchers in Lewis' Summer Undergraduate Research Experience (SURE) program, in which two Computer Science students, Elie Shmayel and Brian Wilhelm, conducted research this past summer. Using a visual programming environment called Scratch, kids can work with the same kinds of instructions and make the same kinds of decisions older, professional programs make as they figure out how to write programs that solve problems, simulate systems, tell stories, and entertain. Five groups of children from area grade schools came to the Computer Science labs that afternoon to play with Scratch as well as to control little bird-like robots called Finches using computer programs they wrote. The ACM students who guided the children as they explored the world of software development were Lewis Computer Science majors Rob Granko, Mike Korby, Elie Shmayel, and Brian Wilhelm, and Computer Science alumnus and current Master of Science in Information Security graduate student Brandon Greene. The Computer Science department at Lewis will hold a camp this summer to help kids learn more about computer programming and other exciting areas Computer Scientists explore, so stay tuned. 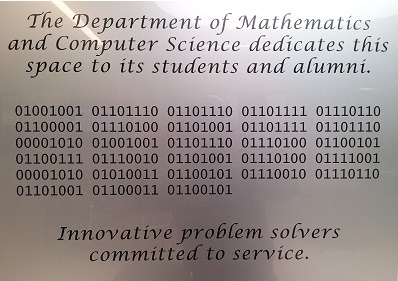 On September 26, 2012, the Department of Mathematics and Computer Science celebrated a very special event in its history. Nearly 100 people turned out to celebrate the dedication of the Department's new, spacious, state-of-the-art computer labs. The evening commenced with an excellent presentation on the future of mobile computing by tech visionary and entrepreneur Alex Bratton, CEO and Chief Geek of Lextech Global Services, a recognized leader in enterprise mobile apps development. His talk was extremely inspiring to our students, because it showed just how influential they can be with the skills and knowledge they are acquiring as computer scientists and mathematicians. Students had an opportunity to demonstrate the mobile apps they had created for Mr. Bratton prior to his talk, and he was impressed at what they had managed to create in just 15 weeks. After his talk, the crowd moved to the new laboratory space, where Br. James Gaffney, President of Lewis University, congratulated the students, faculty, and alumni for their past successes and cheered a bright future. Steve Zlatic, Director of Campus Ministry, then celebrated the Dedication of the labs. 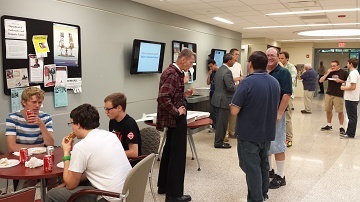 After the Dedication, every lab was staffed by students and faculty demonstrating the kinds of things we do in the Department, from mobile apps development to networking and security and operating systems to interactive games to mathematical simulation. 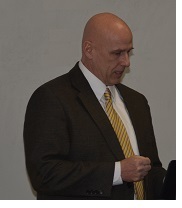 You can see more pictures of the event as well as read Dr. Klump's read "State of the Department" address. Many alumni, students, and friends turned out, making this an extremely special event. Thanks to everyone who came. Noted tech entrepreneur Alex Bratton, CEO and Chief Geek of Lextech Global Services will present his vision from the front lines of the mobile computing revolution in a talk entitled ìMobile Technology is Changing the World. Are You Ready?î Alex will describe the profound ways in which the touchscreen is currently revolutionizing how we communicate ideas, share memories, and conduct business. His talk is informed the efforts he and Lextech have made in creating mobile applications within unprecedented functionality. As Lewis Universityís Department of Mathematics and Computer Science continues to develop its curriculum in mobile application development, we are thrilled to have someone of Alex and Lextech share their experiences in this increasingly important field with our students, faculty, and alumni. The talk will be held in the University Dining Room at 6pm on Wednesday, September 26. There will be a reception before it at 5:30, and the Department's new lab space will be formally dedicated after Alex's presentation at 7pm. Prometheon, the interdisciplinary group for students who love technology, will be holding a video game party in late October, just in time for Halloween. There is a poll on the group's Facebook page to help determine when the party will be. If you are interested in attending, please take a moment to respond to the poll here. David Katauskas, a 1996 Lewis Computer Science graduate and member of the Lewis' Computer Science Advisory Board, was named Chief Technology Officer of custom software developer Geneca on September 6. He formerly served as Client Partner for Geneca. As CTO, David will set the direction for Geneca's technology and software development practices. In his 20 years in IT, David has worked as a software developer, enterprise architect, system designer, IT strategist, and client partner. These past experiences have helped prepare David for his new role as Geneca's technology visionary and evanagelist. The Department congratulates David, is proud of his accomplishments, and is grateful to him for his service on our Advisory Board. Representatives of Geneca, an innovative enterprise software development firm based in Oakbrook Terrace, visited Computer Science students and faculty on Wednesday, September 5. Mike Reyes, a senior developer with Geneca, talked about his experiences as a young software developer, what he looks for in a job, what he sees as the skills most in demand, and how he keeps current with all the changes that occur so rapidly in programming languages and tools. His insights helped students understand that, despite the rapid pace of change, with technologies shifting every couple of years, the foundation they are getting in their classes at Lewis will help them keep pace with those changes. He also encouraged them to find opportunities to innovate everywhere, because that will give them a chance to hone their skills and fuel their interests. The students also heard from Mike Denton, Director of Recruiting for Geneca, about how they can best position themselves for careers with Geneca and other software development firms. The Mathematics and Computer Science department is actively trying to strengthen relationships with area IT firms in an effort to increase the number of internship and career opportunities for its growing number of students. The Department is very grateful to Geneca for sharing its perspectives with us. The Department is very excited to move into brand new classroom, lab, and office space for the Fall 2012 semester. Located just off the new Science Center at Lewis University, this beautiful facility features four new state-of-the-art computer labs. The Mathematical Computing Lab will focus on teaching and investigating mathematical concepts using computers. The Networking and Security Lab will host instruction in the design and implemention of computer networks and processes by which computer systems can be made secure against cyber attack. The Software Development Lab will focus on teaching students a variety of programming and software development techniques. Finally, the Ubiquitous Computing Lab will explore issues related to non-traditional computing platforms, including mobile and embedded systems. 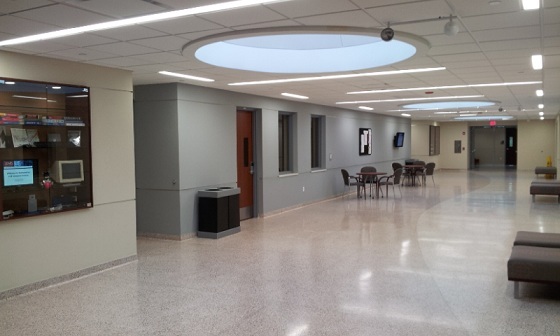 The new wing also houses offices for Department faculty and a new reception area. The Department is honored and excited to have such an outstanding environment in which to teach and to learn. For the seventh straight year, the Mathematics and Computer Science Department hosted a booth at Joliet's annual Kidzfest, a great, free benefit aimed at entertaining and teaching the area's children. This year's event took place on Saturday, August 4, in downtown Joliet. Once again, Lewis University sponsored the event and hosted a mini-campus that featured booths from several academic departments. This year's Math / Computer Science booth was all about programmable robots. Dr. Klump and Br. Tom, with tremendous help from students Vanessa Basick and Nathaniel Jordan, helped kids play with and program robots such as The Finch, The Scribbler, and Lego Mindstorms. Programming The Finch gave students an opportunity to learn the Scratch and Alice programming environments. 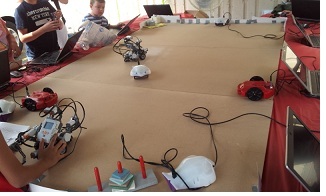 The children were able to control the movements of the robots around the "Robot Stage" and even made the Mindstorms kick a ball and back up from obstacles. The wonderful thing about having children work with robots is that they get an opportunity to learn how to write software. Writing software is nothing more than knowing how to arrange instructions in to implement tasks either in a step-by-step manner, a repetive manner, or conditionally based on what's happening in the robot's environment. Kids learn these skills while having fun. This year's Math / Computer Science booth at Kidzfest gave them an opportunity to do that. 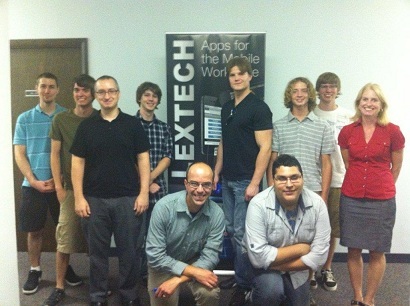 On July 25, ten Lewis Computer Science students and faculty visited Lextech Global Services in Lisle, Illinois. Lextech specializes in developing mobile applications for enterprises. They employ nearly 50 application developers and other personnel who help organizations streamline their processes using cutting-edge mobile devices and software. 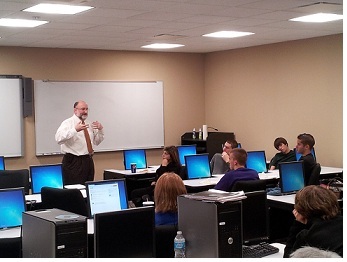 The students spent nearly two hours with Lextech staff, including its CEO and Chief Geek Alex Bratton. They were shown Lextechís newest apps, which really opened their eyes to just how powerful and useful mobile applications can be to an organization. The kinds of apps Lextech develops transform the tablet or smartphone from a captivating consumer electronics device to an essential business tool, and the students and faculty were very impressed by this. They had an opportunity to ask Alex and the rest of the staff lots of questions about the development process specifically and about entrepreneurship in general. Alex stressed the need for students to be quick learners and to immerse themselves in their chosen field, always pushing the envelope of what they know. The trip concluded with a tour of Lextechís facilities, which gave the students a taste of what it means to work in a highly agile, driven, and creative technology environment with other Computer Scientists. The Department is very grateful to Lextech for its hospitality and looks forward to interacting with them more in the future as it continues to develop its mobile applications curriculum. Dr. Paul Kaiser came to Lewis in 1973. That means almost forty years' worth of mathematics and computer science majors have benefited from his amazing generosity, dedication, wisdom, knowledge, and genuine concern for their well-being. Perhaps nobody has lived the mission of Lewis University to the extent Paul has. And perhaps nobody has shaped a department more than he has. He played key roles in forming both the Computer Science program in the late 1970s and the Master of Science in Information Security program in 2004. He has also served as Dean of Students and Dean of the College of Arts and Sciences. Even though he officially retired from Lewis in 2007, Paul has continued to help the Department, and he has even volunteered to help the Department with its assessment efforts. This year, he taught Advanced Calculus I and Advanced Calculus II to some very lucky Math majors. Today, May 4, was Paul's last class. Or is it? We sure hope not. While we certainly appreciate his desire to spend more time with his two grandchildren, here's hoping they get sick of hearing his Bob Dylan mp3s and allow him some time to get back into the classroom where he can teach calculus to another 20 years worth of math majors. Thank you, Paul. Students in CS 417: Mobile Application Development learned how to create applications for Android devices, including Android phones and tablets. Under the instruction of Dr. Cindy Kersey, the 19 students in the class divided into teams to create games and productivity software for these incredibly popular devices. Some of the apps the student teams created are a version of the classic game Keno, a tower defense game, a personal fitness tracker, a Disney quiz game, a treasure hunt, and a mobile campus guide. 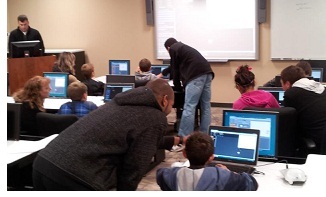 The students used Eclipse, an Android emulator, and 7" Android tablets to develop, deploy, and test their games. This course will be offered again next spring. In the Fall, Dr. Kersey will be teaching a weekend course on iOS development in which students will learn how to create apps for iPads, iPhones, and iPods. 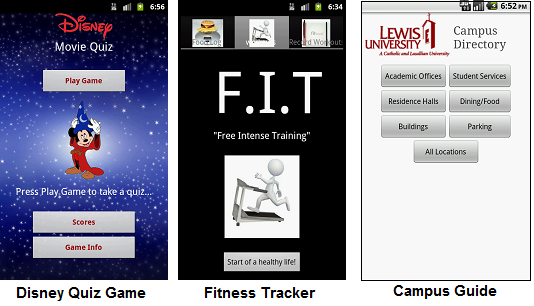 Screenshots of some of the apps from this semester are shown here. 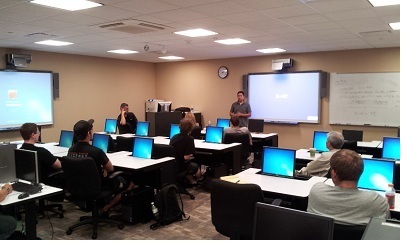 The capstone experience in the Master of Science in Information Security program, which is co-organized by the Department of Mathematics and Computer Science, requires students to explore a topic in the information security field. The students work under the guidance of a professor who helps them focus their research on the critical pieces of the problem they explore, document their findings, and then present their work. Here are links to this Spring's capstone projects. Undergraduate Computer Science and Graduate Information Security Students have joined forces to launch a local chapter of the Association for Computing Machinery (ACM). ACM is a world-renowned organization of computer professionals who share their passion and knowledge for computer and data systems. Lewis is proud to have its very own student chapter of this prestigious organization. Twenty-two new members attended the first meeting on Monday, April 30, to discuss plans for next year. The group elected officers, including Muhanned Al-Aqili, Graduate Student in Information Security, as President; and Computer Science students Brian Wilhelm, Rob Granko, and David Tennant as Vice-President, Treasurer, and Recorder, respectively. The group decided to add subcommittees for community service and marketing and communications. Next year, the group will invite industry experts to campus as part of ACM's guest speaker program. You can learn more by joining the Lewis University ACM Chapter on Facebook, or, eventually, by checking out the group's website, which is currently being built. 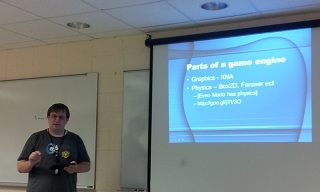 Nathan Adams, a 2010 Computer Science graduate, explained and demonstrated an XNA-compatible game engine he has created called Axios to current CompSci students and faculty on April 23, 2012. Axios provides state management, windowing, user interaction, and physics controls for 2D games and game assets written for XNA platforms like the XBox 360, Windows Phone, and PCs. Axios leverages physics effects form Farseer, which is similar to the physics engine used in games like Angry Birds. Nathan's presentation, which you can download here, contains a number of code snippets to demonstrate how the engine was coded and how to use it. 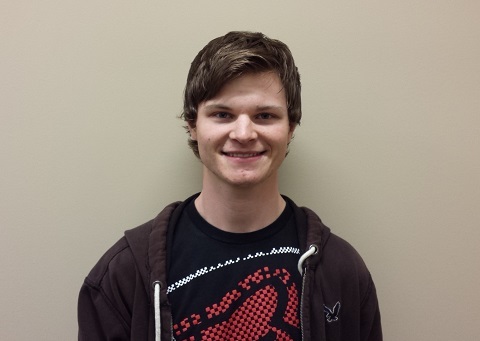 Nathan currently works at Argonne National Labs but continues his love for video game programming. He had been in the first video game class offered back in 2008. 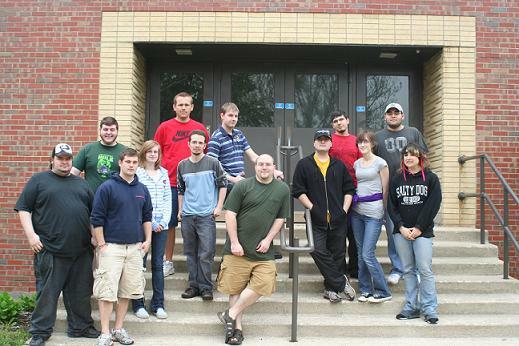 In 2005, a group of Computer Science students founded the Prometheon Technology Club, a group for students from all majors who love technology. The group enjoys all things computer-related, including consumer electronics, video games, and electronics projects. They have built MAME cabinets, tricked out computer cases, customized XBoxes, held robotics competitions, and hosted all-night gaming parties in the Department's computer labs. They have also hosted educational sessions on computer security, buying an HD television, and other very relevant topics. They've also helped perform some of the used computer collection drives and refurbishment efforts and have donated club money to support Dr. Paul Kaiser's computer deliveries to church groups in New Orleans. In other words, they have had a very positive impact on the community. On Monday, March 19, the group will be holding a "get to know us" event in the Student Union from 6 - 9pm. Students from all majors are welcome to stop by, have some pizza, play some games, and learn more about this really cool computer group. This is a fun group to join. Seven Computer Science students represented Lewis at this year's ACCA Computer Programming Competition. The students, who were split into two teams based on their year in school, wrote code in C++ and Java to solve a variety of complex logic problems for three hours on Saturday, February 25. Dr. Cindy Kersey, Assistant Professor of Mathematics and Computer Science, was their coach and helped prepare them during the weeks leading up to the competition. Pictured, from left to right, are Joe Block, Dr. Cindy Kersey, David Tennant, Katie Colaianni, Jonathon Ronchetti, Christopher Pelech, Rob Granko, and Brian Wilhelm. Congratulations to these great programmers and their coach. 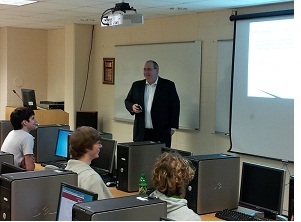 Guy Thier, a Lewis University Computer Science Alumnus whose career has led him to a CIO position at Bally Total Fitness, a billion-dollar company, came to speak to about 25 Computer Science majors and their instructors on Wednesday, February 23. Guy has hired hundreds of IT professionals during his career, and there are a number of personality traits and skills he looks for during the interview process. Guy spoke to the students about what he looks for when building a team, how he cultivates an innovative culture, and how they can differentiate themselves when they enter the job market. He gave a very engaging and practical talk that was loaded with excellent advice for the students as they prepare to enter the job market and continue to make educational and co-curricular choices that will shape the beginning of their careers. You can download his slide presentation here. The point Guy drove home repeatedly is that Computer Scientists have the rare opportunity to see and affect all aspects of a company, and that, if they can combine their excellent technical knowledge with clear oral and written communication skills and commit to lifelong learning, they will have outstanding careers. We are grateful for the time Guy spent sharing his expertise. Lewis Computer Science major Brian Wilhelm is profiled in an inspiration piece in the February 22nd issue of The Chicago Sun-Times for his heroic service to our country. Click here to read the article. Brian is an outstanding computer science student who is focusing on information security but is taking advantage of the much broader focus computer science brings to research a host of other topics, including the use of computers to predict trends in financial markets. The Department is very proud of Brian's accomplishments and is honored to have him here. Lewis math major and computer science minor Jessica Dreher attended the Nebraska Conference for Undergraduate Women in Mathematics at the University of Nebraska-Lincoln January 27 - 29, 2012. The conference welcomed outstanding undergraduate women mathematicians at all stages of their careers to share research and learn about career and graduate opportunities for female mathematicians. "There were a lot of talks about graduate school programs that I could go into once I get my bachelor's degree. Hearing about all of these really made me determine that going to graduate school is a definite thing that I would like to do," said Jessica. "I also learned a lot about the different career opportunities that I have with a B.S. in math. I now know that companies would want to hire me because of having a degree math because they would feel like if I can do math then I can do anything." Jessica applied for the conference and was accepted based on her outstanding academic record and letters of reference from math and computer science professors. Congratulations, Jessica! Lewis Computer Science alumni Mike Skwarek and Matt Kwiatkowski came to campus Wednesday, October 12, at 2pm, to discuss cyber security opportunities for Math and Computer Science students at Argonne National Laboratory. Mike is Interim Chief Information Office and Director of Computer Information Systems at Argonne, and Matt is Acting Chief Information Security Officer and Cyber Security Program Manager at Argonne. The Department of Mathematics and Computer Science at Lewis enjoys a long history with Argonne, as several of our alumni work there. In fact, Argonne has 70 Lewis alumni as employees, with 40 Lewis alumni in IT, most of whom graduated from the Department of Mathematics and Computer Science. This is a great opportunity for Lewis Math/CS students to gain on-the-job experience with a recognized world leader. You can download Mike and Matt's presentation here to find out more about the opportunities. We are very pleased Mike and Matt came back to their alma mater to let our students know about all the exciting opportunities available to them in cyber security. The Department of Mathematics and Computer Science at Lewis had the pleasure of welcoming Mr. David Katauskas, Client Partner and Enterprise Architect at Geneca Systems. Dave graduated with a Bachelors Degree in Computer Science from Lewis in 1996. 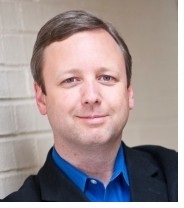 He now leads custom software development projects for a variety of business clients. Dave talked with the students about emerging technology trends and encouraged them to pursue their passions in Computer Science as the best way to distinguish themselves in the job market. He claimed that everything he studied in his Computer Science courses, including the challenging technical content and the department's emphasis on graduating well-rounded students who communicate well, has helped him forge a very successful career. Dave also stuck around after his talk to give students advice on searching for a job and polishing their resumes. Dave's success is a great example of how empowering a degree in Computer Science can be, for the well-rounded computer scientist can deftly solve problems in a whole host of settings, from scientific to entertainment to financial, and for a variety of businesses. Students in CS 200: Introduction to Computer Science learn all about the wonderful and diverse opportunities open to Computer Scientists. One of those opportunities is to write software, including video games. Writing video games is hard work, requiring great programming skill, a deep knowledge of graphics and computational hardware, and great math skills. However, students in CS 200 created their very own video games after only three weeks of class thanks to an innovative programming environment called Scratch. Dr. Cindy Kersey assigned students the challenge to create a game where the character tries to avoid an object, collect an object, or both. Using the visual tools provided by Scratch, the students in CS 200 were able to meet this challenge and unleash their creativity and visual flair, all while learning object-oriented programming constructs. You can see samples of their work here. Later this semester, students will be programming robots and creating original works of art algorithmically. All this goes to show that Computer Science is one of the most interesting and entertaining disciplines around. Lewis University hosted an undergraduate research program during Summer 2011 called SURE: Summer Undergraduate Research Experience. The purpose of this exciting program was to give highly qualified undergraduate students an opportunity to pursue research projects with a faculty mentor. The Department of Mathematics and Computer Science is very proud to have had two outstanding students participate this summer. 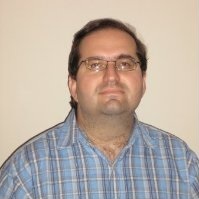 Brian Wilhelm worked with Dr. Ray Klump to apply data mining techniques and sophisticated algorithms to analyze market trends to determine algorithmically the best times to buy and sell stocks. Mike Korby worked with Dr. Cindy Kersey to develop an Android app called Frustdroid that enabled a phone to determine the mood of its user based on readings from its sensors. Experiences like these give students an opportunity to explore an interest of theirs within the field at great depth. It also helps prepare them for future graduate study. These kinds of experiences are becoming increasingly commonplace at Lewis, and the Department of Mathematics and Computer Science is fully committed to involving students in this great work. To complement its recent addition of the course Mobile Application Development, which will be offered as 70-417 for the first time in January, 2012, the Department of Mathematics and Computer Science has purchased the tools students will need to start developing apps for the most popular mobile computing platforms: Google's Android and Apple's iOS. The department has purchased a set of Samsung Galaxy Tabs for learning Android programming, and a set of Apple iPad2's and iMacs for learning iOS programming. The department is excited about the opportunities this will give students to learn one of the most popular and most in-demand skillsets for computer scientists. Dr. Cindy Kersey and her Software Engineering class completed a software development project for Lewis' Office of Service Learning. The project will help the Office of Service Learning keep track of the many organizations served by various service-learning courses at Lewis. The students developed their solution through all five phases of the Software Development Life Cycle (SDLC): Planning, Analysis, Design, Implementation, and Support. They designed and wrote the software as an object-oriented PHP program according to the requirements they gathered from the Office of Service Learning. Here is a picture of Dr. Kersey and her students along with Christie Billups and Rachel Burke from the Office of Service Learning. This is just another example of the real-world kinds of activities students in Computer Science get to pursue at Lewis. It also demonstrates how skills in Computer Science can be applied to a wide range of fields. 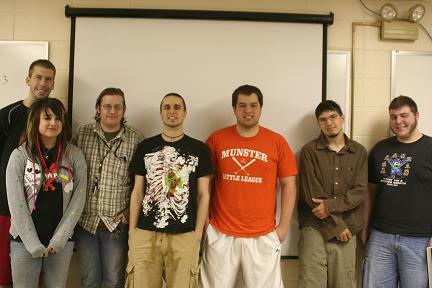 The students in CS 415: Video Game Programming II completed their game projects. The games, which were all original creations involving 3D views, collision detection, sound, video, shaders, explosions, and special effects, were written in C# for Microsoft's XNA platform. These games can run on either a PC or an XBox. 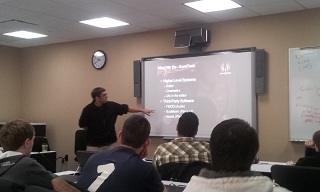 Students presented their games in a written sales pitch as well as through an in-class presentation. One student created a driving game where the objective was to collect cans of gasoline to thwart the current inflation in gasoline prices. Another student created an island-themed game where the objective was to collect monkey heads that inexplicably fell from the sky. 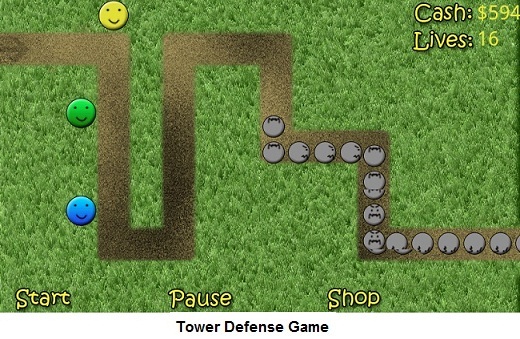 The game shown here is a classic tank-on-tank combat game in 3D. 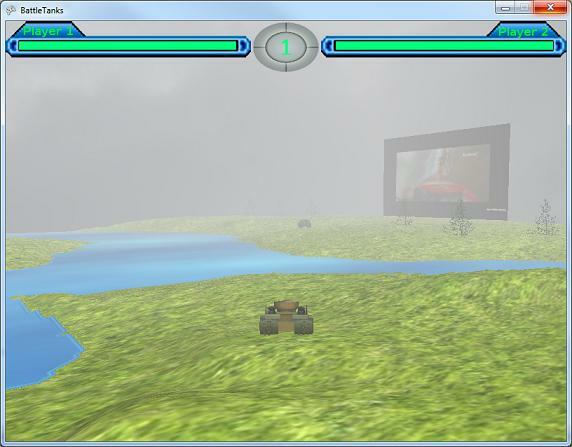 The game even features a drive-in movie, which you can see in the fog in the distance. 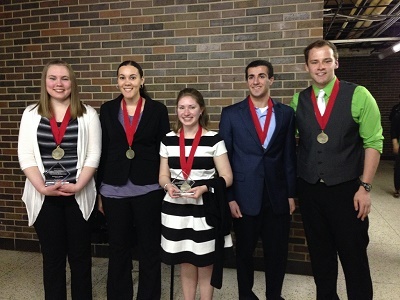 Alexandra Hahn, Levi Moffett, Megan Scara, and Sara Tippy are shown here with advisors Margaret Juraco and Br. Tom Dupre. This is quite an honor for these students, as the the requirements to join KME are quite stringent, and KME has wide recognition in the field. Congratulations to these four outstanding young mathematicians. Congratulations to Doug Anderson and Peter Allen, our Departmental Award recipients for Spring 2011. Doug won the award in Mathematics, and Peter won the award in Computer Science. Each semester, the faculty of the Department choose one student in Mathematics and one in Computer Science to receive its top academic honor. Doug and Peter both have outstanding GPAs, outstanding command of their respective fields, and great potential. Congratulations to Doug and Peter! Every Spring during Finals Week, Lewis University holds "A Celebration of Service", an event that recognizes faculty and staff celebrating milestones. This year's recipients included two from the Department of Mathematics and Computer Science. Dr. Steve Berger was recognized for 30 years of service to Lewis, and Dr. Ray Klump received the University's Distinguished Lasallian Educator award. These recognitions demonstrate the outstanding quality of the instruction and service Math and Computer Science students receive here at Lewis. 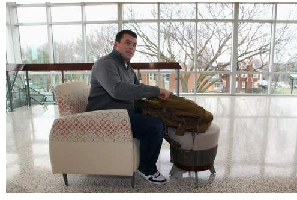 Martin Pellicore, a Junior in Computer Science, is a winner in Lewis' "Come Clean, Go Green" Sustainability Contest. His project is called "Green Stop". "My idea was to have a location on campus at which students and faculty could make sure their car tires are filled to the proper pressure and if they are not there was to be an air compressor available to fill their tires. ", says Marty. The idea came from his findings that he could save about $175 per year on gas (assuming it costs $4 / gallon) if he kept his tires full all the time. Marty concludes, "So I thought what if everyone on campus saved that much- as a university we could potentially save thousands of gallons of gas yearly!" Congratulations, Marty! On February 26, Lewis' two teams of computer science students won awards at the annual ACCA Programming Competition. Our Novice Team, which consisted of Jeff Brick, Geoff Powell, David Tennant, and Elie Shmayel, placed took home an award for Fifth Place. Our Advanced Team, consisting of Peter Allen and Dan Ancich, took home Third Place out of a crowded field of thirteen teams. The competition, which was held this year at Wheaton College, asks students to write programs to solve 8 rather complicated problems in the language of their choice. Our Novice Team, which consisted of students who have been programming for only about two months, used Java. 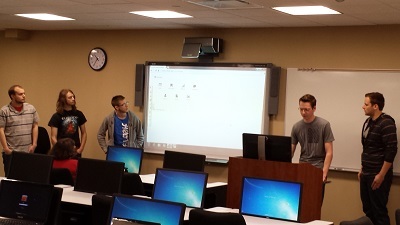 Our Advanced Team used C#, the language they've learned this year in their video game programming courses. We are very proud of the great accomplishments of these two teams! In Dr. Cindy Kersey's CS 200 course, the first course computer science students take, students used the Java programming language to create interesting patterns from static images. The lesson taught students how to combine selection and repetition statements to achieve some really interesting effects. This was one of the assignments in the new redesigned introductory course, which was changed this year to provide a broader, more engaging introduction to the field of computer science that is more representative of the diversity of opportunities open to computer scientists. Click here to see the cool images the students created. The Lewis University Department of Math and Computer Science was recently awarded a grant from Unity Technologies. Unity Technogolies is an award-winning company based in San Francisco that is known for developing 3D technology for gaming and simulation. This grant was given to the department to create video games for Android mobile devices, such as Android-based phones and upcoming tablets. Dr. Cynthia Kersey and Dr. Ray Klump will lead this grant effort to develop curricula for mobile application development, including for mobile video games. Lewis has one the first phase of the grant, which includes software development applications and a mobile device on which to deploy projects built using those applications. They are now working to secure the second phase of the grant, which would include 20 Android-based smartphones for use in the classroom. Welcome to the 2010 - 2011 School Year! The faculty of the Department of Mathematics and Computer Science are honored to have the opportunity to work with our students. We are grateful that you have chosen Lewis as the place to study two of the most challenging, interesting, and promising disciplines around today. We take our jobs as teachers very seriously. It is our passion. We want every student to feel welcome and supported, comfortable enough to ask questions and to seek help, and inspired to pursue your interests and to strive to learn more. We will do our best to create a challenging and engaging learning environment where you can mature into the mathematicians and computer scientists you hope to be. For your part, you know going in that these two fields are challenging. If they were easy, there would be more mathematics and computer science majors. You are among the brightest students at this university, and you have the intellectual gifts to achieve your goals. The challenge will be to work toward them. Your teachers will encourage you to work hard and do what is necessary to learn the material. Ultimately, however, it is your game, and you have to make it a win. We are happy to welcome you to the Department for the 2010-2011 school year. We are looking forward to a great year together. If you have any questions or concerns, or if you want to make a suggestion for improving the department, please talk to one of your professors, or stop in to see the Chair of the department, Ray Klump, in AS-137 or via email at klumpra at lewisu dot edu. You wouldn't know it looking at the picture, but the computer lab in AS-058-S (the old S120) was completely rebuilt in the last two weeks following a flood that caused significant damage to the ceiling and floor. Facilities personnel put in a new floor, new ceiling tile, new lighting (no more of that dingy lighting the old lab had), and they even replaced the doors between the lab and AS-060-S (the old S121) with cinderblock. Dr. Berger worked tirelessly making sure the computers were ready to go. And staff from ITSO did a great job rescuing the equipment and minimizing our damages. Thanks to a great team effort, the new lab looks really good. Lewis University is one of the 50 best undergraduate institutions in the U.S. and Canada to study game design, according to The Princeton Review, one of Americaís most widely known education services and test preparation companies. The Princeton Review developed its ìTop 50 Undergraduate Game Design Programsî list ñ the first project of its kind ñ in partnership with GamePro, one of the most respected brands in the video game industry, reaching over 3 million gamers a month. The list is reported in GameProís April 2010 issue and on the websites of The Princeton Review and GamePro. It names eight programs for top honors as the best of the best. They are identified in rank order, one to eight (list follows). The remaining 42 programs are listed in alphabetical order and not ranked. Of the roughly 500 programs at which students can study game design in the U.S. and Canada, The Princeton Review selected these 50 programs based on a survey it conducted in 2009-10 of administrators at institutions offering game design coursework and/or degrees. The comprehensive survey numbered more than 50 questions and covered areas from academics and faculty credentials to graduatesí employment and career achievements. Criteria included the quality of the curriculum, faculty, facilities and infrastructure. The Princeton Review also looked at data on scholarships, financial aid and career opportunities. The Department of Mathematics and Computer Science is quite proud of this distinction, especially because it coincides with the launch of the Department's new Concentration in Video Game Programming, which will start Fall 2010. A group of four Lewis Computer Science students placed third in the Advanced Division at the recent ACCA programming competition. Nathan Adams, Dan Ancich, Doug Anderson, and Bryan Pierard completed 5 of 8 computer programs to earn this distinction. Working together as "Team Awesome", the four students used their C++ programming skills and keen mathematical insights to solve these very challenging problems. They were coached by Dr. Cindy Kersey, who helped the students over the past several weeks work out problems from previous competitions. The Department is quite proud of the students' accomplishments and thanks them for representing Lewis Computer Science. Twenty-one students took CS 296: Video Game Development this semester, and the results were impressive. 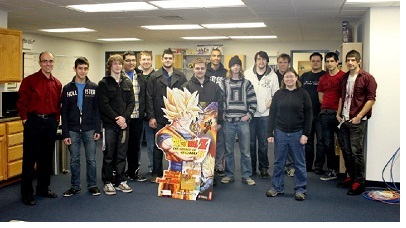 Six teams of students each developed two major video game projects. The first, which they submitted in March, used strictly 2D techniques, while their final submissions had to include effective use of 3D techniques. The groups developed their games in C++ using Direct X, and they produced models in Anim8tor, a free modeling tool. 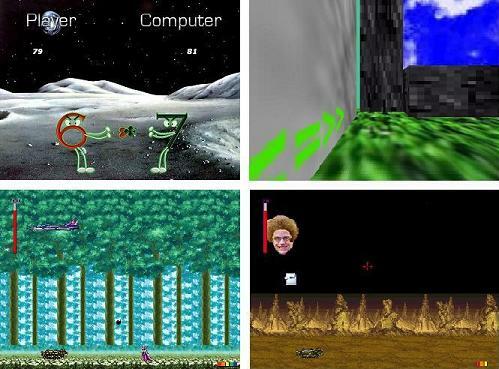 Projects included a tank combat game, a takeoff of the 1980s Atari class Yars Revenge, and epic battle between Batman and Superman, a humorous version of the classic card game War set in outer space, and a very impressive 3D first-person maze game called aMazing, which certainly lived up to its billing. None of the students had had experience programming graphics in C++ prior to this semester, which makes their accomplishments all the more impressive. Here's a group photo of some of the students after their final presentations. Eight students in CS 440 - Software Engineering developed a contact management tool for the Northwest Side Housing Center (NWSHC). NWSHC assistance to homeowners and those looking to become homeowners secure the loans they need to acquire or to stay in their homes. In the current housing climate, NWSHC has seen its workload increase tremendously. To help the organization perform its vital work, the students developed a tool using a language called PHP and a database called MySQL to manage contacts, perform email blasts, generate mail merges, record donations, and automate sending out reminders for donations. The students who performed this work were Nathan Adams, Dan Ancich, Melissa Berardi, Steve Cherry, Tom Garvey, Ray Pellicore, Drew Pickering, and Andrew Valiunas. Most of the students did not know PHP before taking the CS 440 course this semester, but they were able to assemble a quality tool in a short amount of time nevertheless. Not only did they write the software, but they also learned how to construct UML models of the software, including use case, class, sequence, collaboration, and state chart diagrams, that will be very helpful as other students carry on their great work. The students and their professor, Dr. Ray Klump, are happy that this tool will be an important part of NWSHC's daily operations. Here's a photo of the class after the final structured walkthrough. A structured walkthrough is a group meeting in which the developers move test every function in the code to see what works and what doesn't. The Department of Mathematics and Computer Science continues to help organizations who need computers. Using parts and systems collected through drives over the past year, Dr. Kaiser and Dr. Klump have delivered nearly 60 computers to a variety of organizations. Dr. Kaiser delivered 25 last summer to various faith-based organizations in New Orleans, and he made a return trip there in early March to deliver computers to Sisters of the Holy Family, Our Lady Star of the Sea Roman Catholic Church, and various African-American Baptist Churches. Dr. Klump has delivered computers to Crisis Line of Joliet, the Northwest Side Housing Center, and the Wendell Smith Elementary School in Chicago. The Department plans to continue this work to bring computers to non-profits. If you have a computer to donate that is from 2002 or later that you no longer plan to use, Dr. Kaiser and Dr. Klump would appreciate your help. Congratulations to Urszula Budz, the recipient of the Spring 2009 Departmental Award in Mathematics. 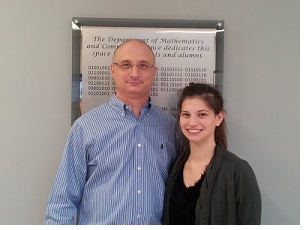 Urszula, who graduates on May 17, earned a GPA of 3.77 and participated in KME, our mathematics honor society. She also participated on the three-person team that won second place at the ACCA Programming Competition in February. Thank you for your great work, Urszula, and good luck in your future endeavors. Brittany DiPietro, a junior in Mathematics at Lewis, will be attending the Summer Mathematics and Statistics Research Institute (SUMSRI) from June 1 to July 17 at Miami University in Ohio. This is quite an honor for her. While there, Brittany will be doing guided research in either number theory, discrete mathematics, or multivariate statistics. The Bolingbrook resident also plays catcher for the Lewis women's softball team, and she serves as treasure of the Kappa Mu Epsilon math honors society at Lewis. Congratulations and good luck to Brittany! A team of three Lewis Mathematics / Computer Science students placed second at the annual ACCA Programming Competition. 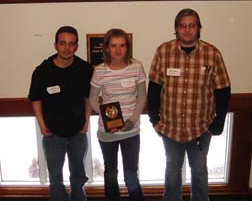 The students, Nathan Adams, Urszula Budz, and Jonathan Heerdt, participated in the Advanced Division. They worked on seven programming problems over a four-hour span on Saturday, February 21. They wrote their solutions in C++. The types of problems the students pursued had less to do with the minutia of syntax and instead required them to devise algorithms to solve complex logic puzzles. To do well in this competition, the students had to think clearly and quickly and then translate those thoughts into C++. The department is very proud of their fine accomplishment and looks forward to participating again next year. 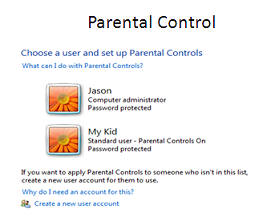 Betti Baytar-McTurk, a student in Lewis' Master of Science in Information Security program, has created a guide for parents on configuring Windows Vista's child protection mechanisms to provide a safe computing environment for children. The presentation describes how to configure Vista to monitor the surfing and application usage of kids and to report the child's activities to parents. Betti believes very strongly in the importance of this issue. If you are interested in seeing Betti's slides, please click here to download them.